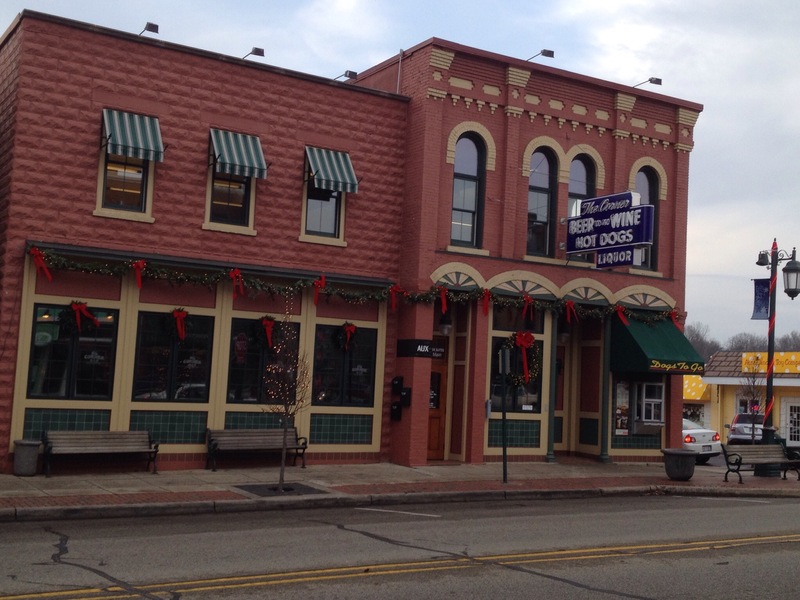 Once we left Leelanau, we headed south and set up base camp in Byron Center to take care of our various doctors’ appointments. 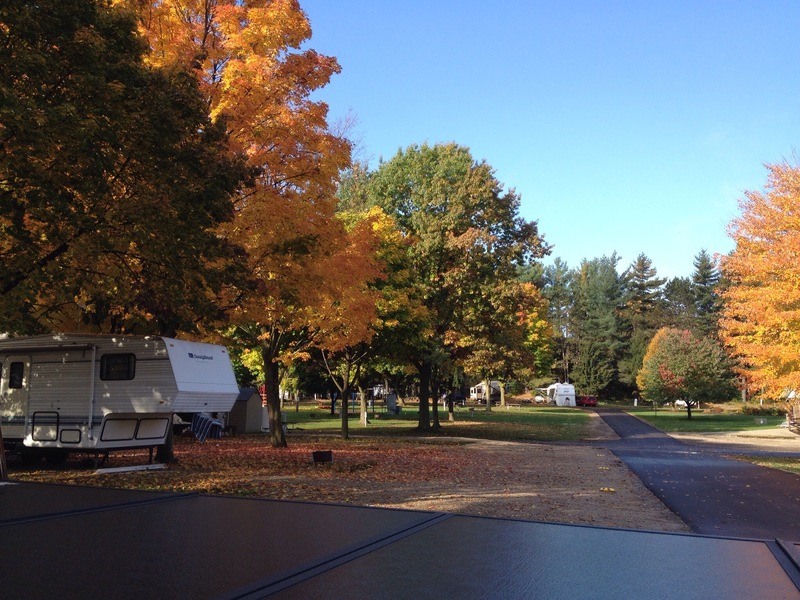 When we arrived at Woodchip Campground, we experienced a bit of deja vu, as we were assigned the site next to the one where we wintered in 2014/2015. With just one week scheduled to accomplish everything we had planned this go-around, we had our work cut out for us. Still, we made sure we had time set aside to see friends and family and have some fun! 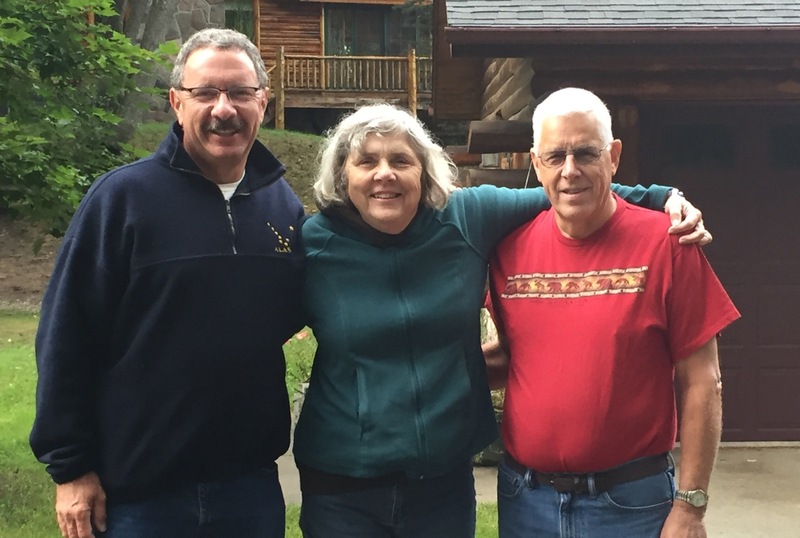 The first visit we made was to see my sister Judy and her husband Dale. We failed to get a photo this year, but it was great to see them! Here’s a photo of us from last year. They took a cruise to Alaska in May and were fortunate enough to see Denali without clouds for almost their entire stay! Ok, so hang on…I’m going to my best to confuse the heck out of you on this one. The next day we visited our friends Diane and Terry. Diana taught with Diane, and Diane’s sister-in-law Diane. Yes, Diane, Diane and Diana…and they were actually a team of three several years! Anyway, Diane and Terry had a former German exchange student of theirs visiting while we were there. 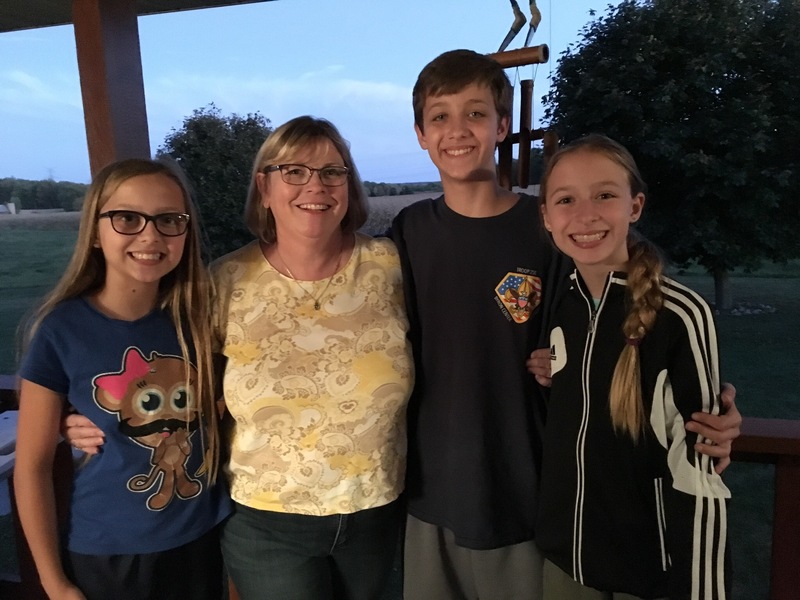 We hadn’t seen Adrienne for several years, so it was definitely a nice surprise! Later in the evening, Diane’s brother Bob and his wife Diane showed up with their triplets! My goodness, these three are growing up! From left to right is Allyson, Diana, Anthony, and Madelyn. Anthony finally achieved his goal of growing taller than Diana! So we failed to get a photo of either Diane…. 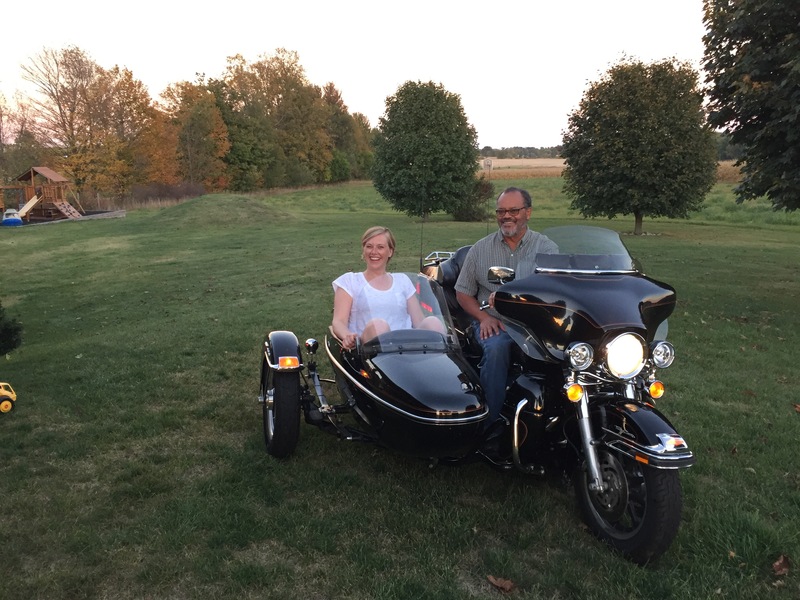 …but we did get a photo of Terry giving Adrienne her first motorcycle ride! It sure was good to see these friends! The next morning, Diana had a mammogram appointment, which turned out great. We then buzzed out to Holland to get an adjustment from my long-time chiropractor. If I could have him tag along on our travels, my back would be eternally grateful. 🙂 After that we headed to Detroit for a Tuesday appointment with my doctor at Henry Ford Health System. This was a routine follow-up from my prostate surgery back in 2010. On the way, we went to Flushing to see Diana’s Aunt Marion, Uncle Bob, and her cousin Debbie. We really enjoyed visiting with them. We then dropped south to Ortonville to visit the cemetery where Diana’s family is buried. From there, we drove to Mt. Clemens and stayed the night at our niece Becky’s house. 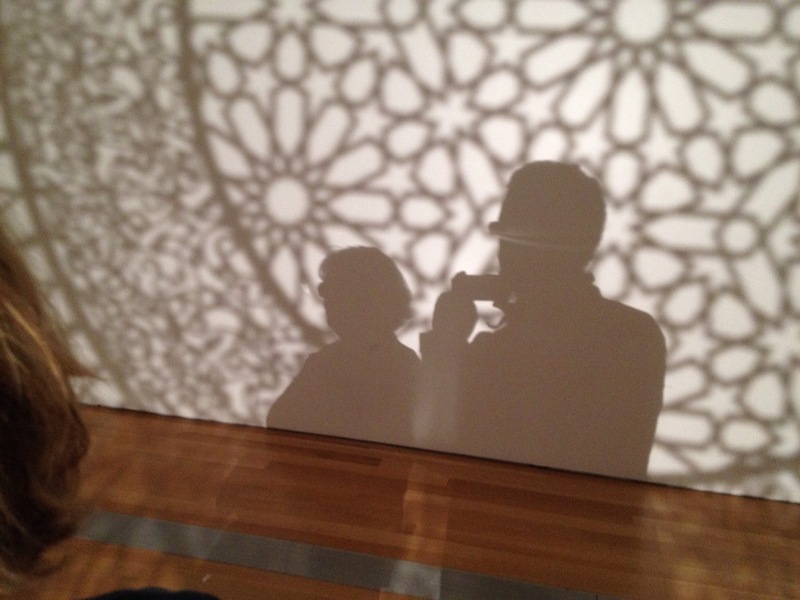 Once again, we totally failed to get photos…arrrghh. Becky and her hubby Dan were excellent hosts and made us a yummy dinner. Diana’s sister Cheryl also came over with our nephew Jared. It was great to see everyone again! Tuesday’s appointment went extremely well, and I’m happy to report that I’m coming up on 8 years cancer-free. Yesssss! ☺️ We then drove back to Byron Center. Sound like a full week? Well, the week ain’t over yet folks…. Wednesday morning, we both had our annual physicals with our primary-care physician, then had our teeth cleaned at our dentist. The physicals went well; the dentist, not so much. It turns out we both needed crowns. One of those resulted in us pushing our stay in Byron Center into the middle of the following week. And just so we could say we had a happy hump-DAAAAY, I started my colonoscopy prep in the afternoon. Oh joy. After drinking a gallon of that horrible concoction, I was moved to use many bad words in my opinion of its maker. Thursday was my colonoscopy (my third) and all was well…except this is the second time in a row I’ve woken up halfway through. Jeez…knock me out already, would ya? Good part is, I’m good to go for another 5 years. So by this time, you are probably thinking we are ready to drop, right? Not. 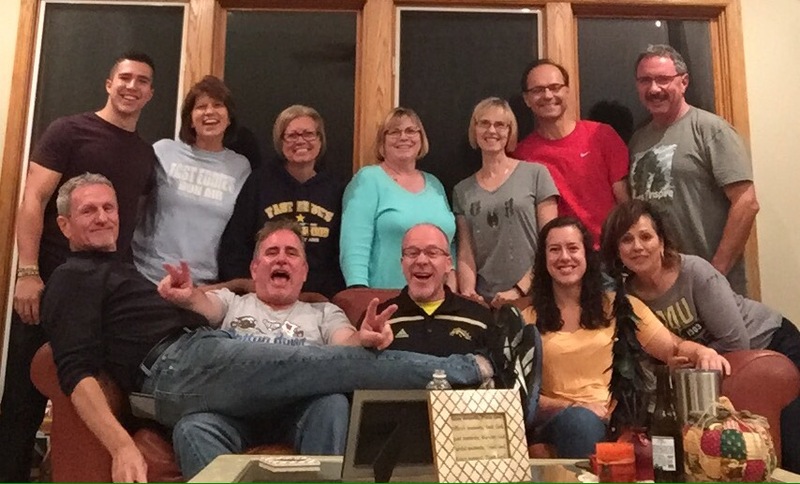 We headed to Kalamazoo for WMU’s Homecoming! We crashed at Mike and Cindy’s house for the weekend, even though they were going to Detroit on Saturday morning for a wedding. Their son Brian and his girlfriend Sarah came over and took the role of surrogate hosts; oh, my…we knew the day would come that the kids would have to chaperone us! Saturday came, and so did the rain and lightning. It poured hard all day long, and the storms forced the postponement of the football game until Sunday. 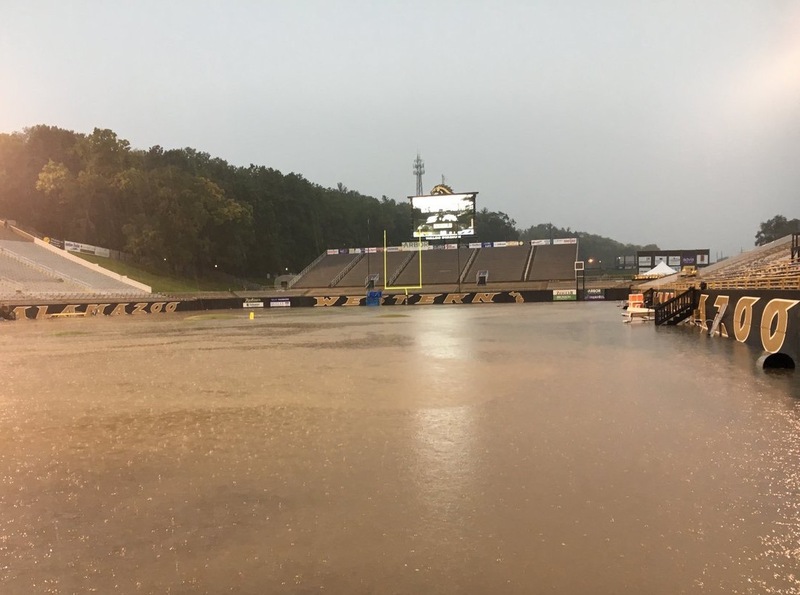 There was concern that the game would have to be played at a different location, as Waldo Stadium was completely flooded. With a Herculean effort, more than a million gallons of water were pumped from the field in time to play Sunday afternoon. Not sure how that affected folks downstream, though. Anyway, most of us skipped the Sunday version of the game, as we needed to head out. For us, that meant Byron Center again. Monday we ran a bunch of errands. One cool thing I want to highlight about that: while we were at Camping World, I brought in a step I had purchased a while back. 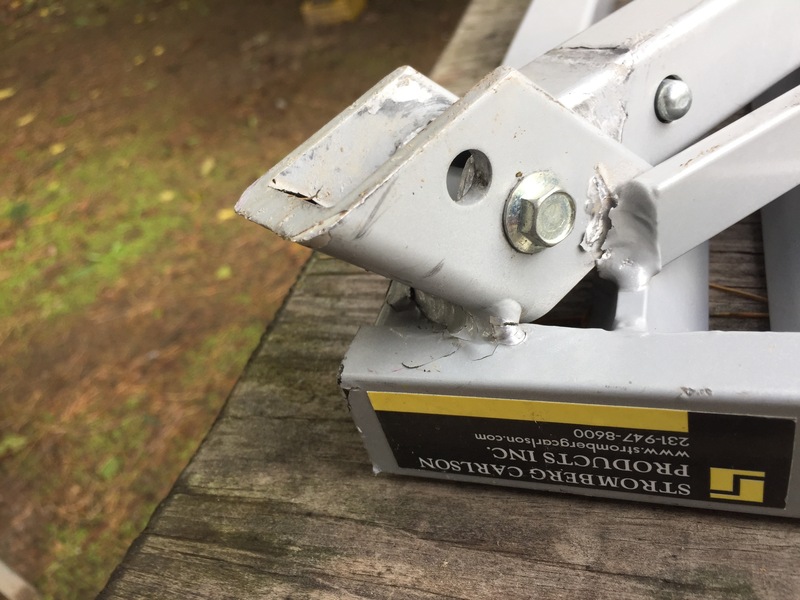 One of the legs had broken on it, so I wanted to see what the warranty was. 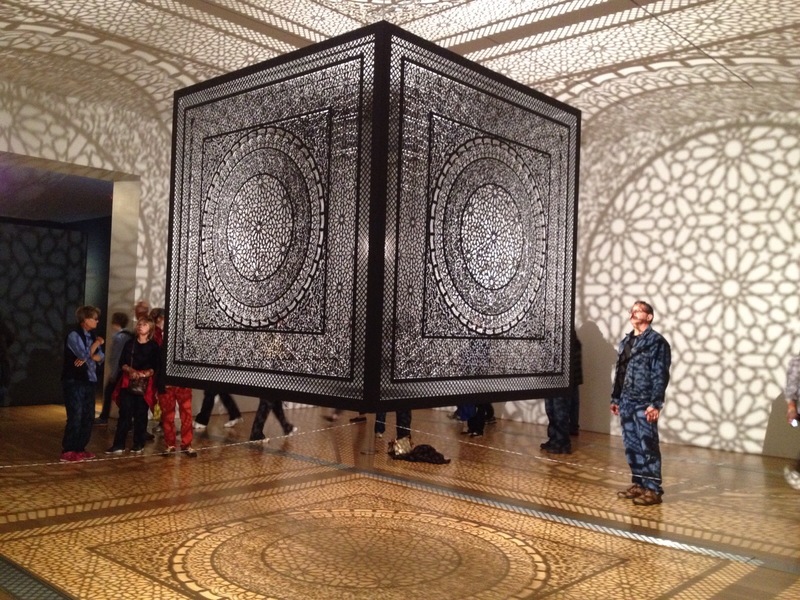 The box didn’t say, but it did say that it was rated at 1000 pounds. And seeing as we are Good Sam Life Members, Camping World was able to tell exactly when we bought it. May of 2012. Probably way out of warranty, but worth a call. Stromberg Carlson requested a photo and a proof of purchase (which Camping World provided), so we zipped that all off to them. Within an hour, they were sending us a new step! That is great customer service that deserves to be mentioned. 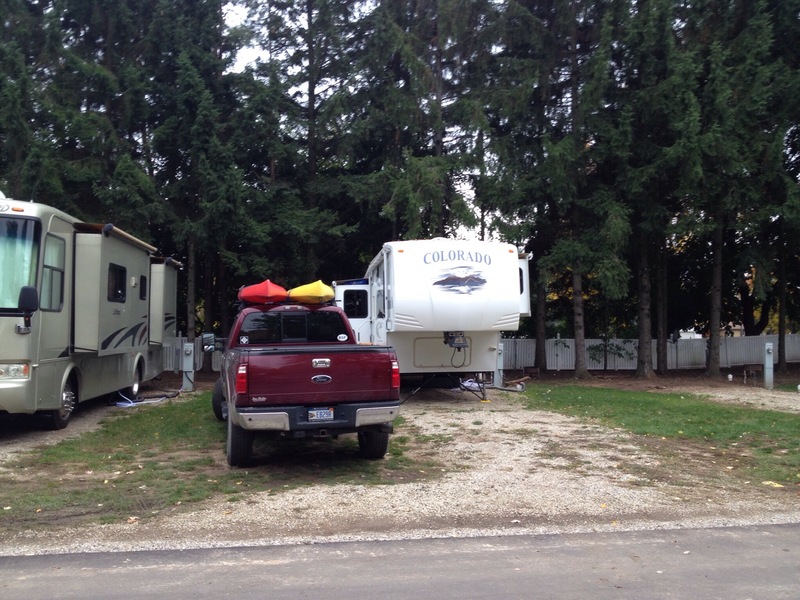 And a big shout out to the Byron Center Camping World for their assistance! On Tuesday, Diana went to lunch with her friend Colleen. 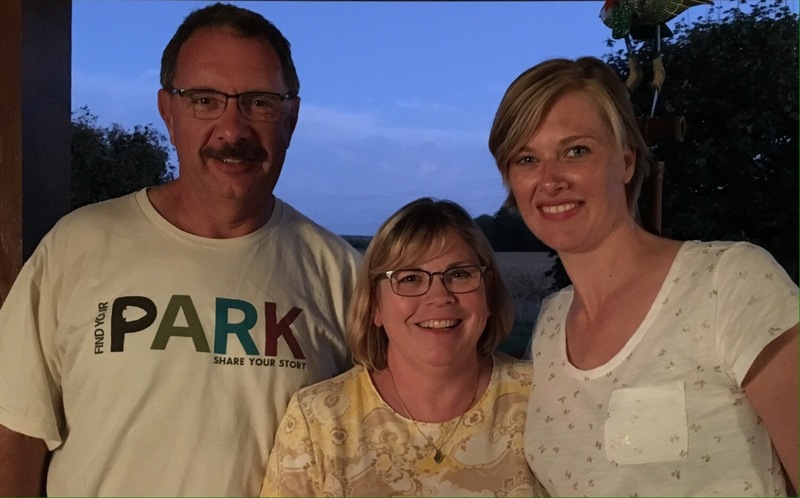 They grew up together in Ortonville, and she now lives in Rockford, just north of Grand Rapids. I stayed home and caught up on a few projects and repairs. Wednesday was Diana’s crown and we were ready to go. We lifted our jacks Thursday morning and headed south towards warmer temperatures and more adventures. Stay tuned to see what we come up with! Click here to search our exploRVistas Amazon link! 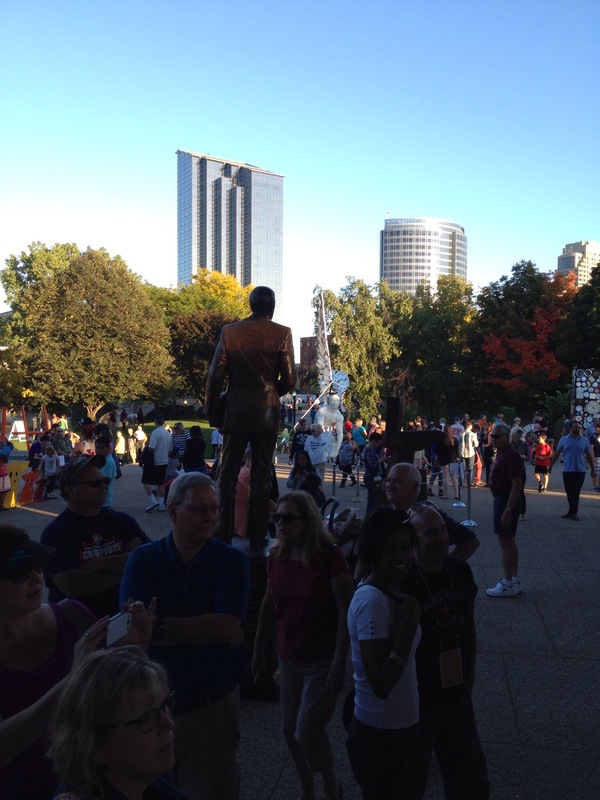 On November 1, we relocated back to Grand Rapids, Michigan to be near Diana’s mom. We are evaluating the situation and trying to make the best decision regarding where to spend the winter. 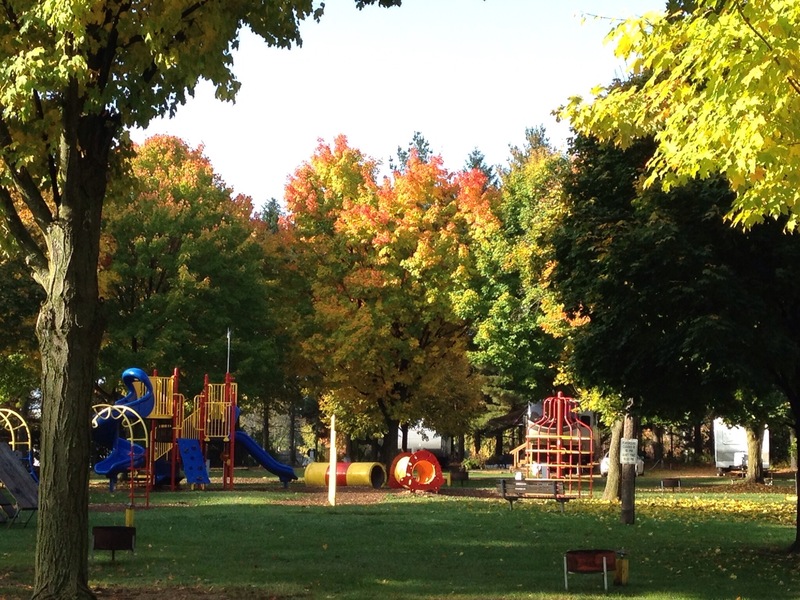 Our first week back, we have been fortunate to have had some great fall weather. 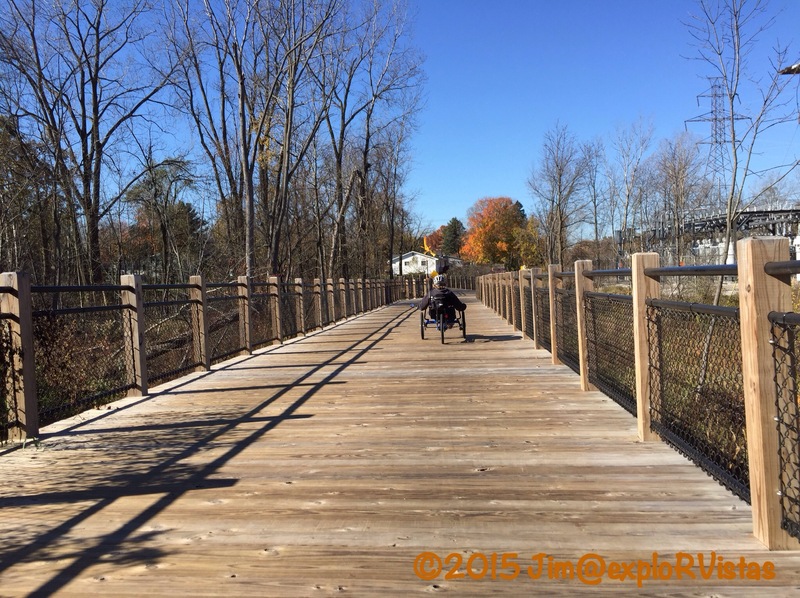 For three consecutive days, we had temperatures in the low 70’s, and we took advantage of the sunshine and checked out the local rail trails. 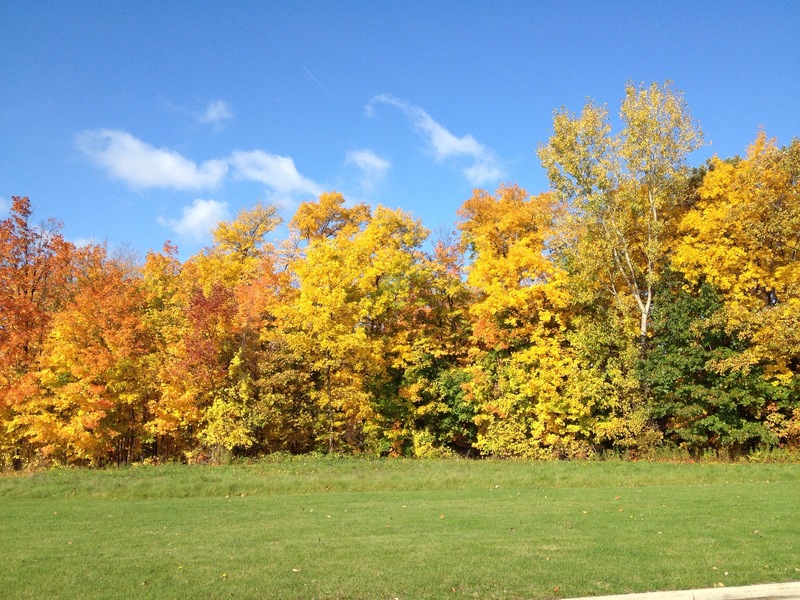 The Grand Rapids metro area is home to an extensive collection of recreational trails, and each year brings more miles of paths onto the region’s map. 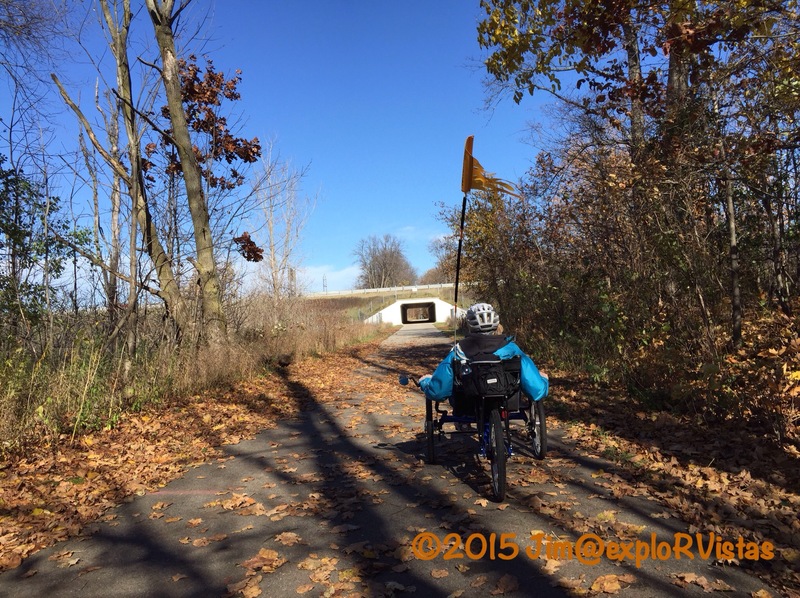 On Monday, November 2, we drove to the southern terminus of Kent Trails in Byron Center. 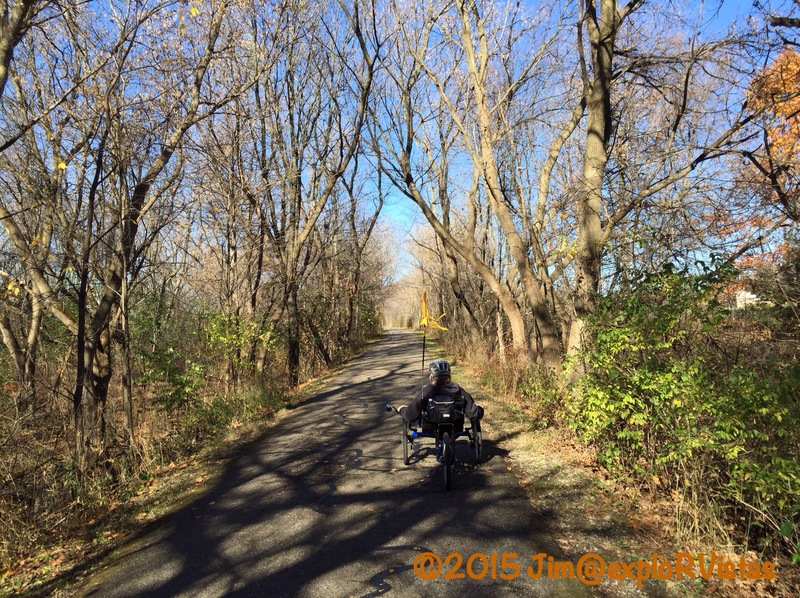 This asphalt pathway was paved in 1992, and is the oldest rail trail in the region. It runs on the rail bed of the defunct Grand Rapids and Indiana Railroad, which first ran on this portion of land in 1870. At its peak, the railroad ran from Cincinnati, Ohio to Mackinaw City, Michigan, and was the route that Ernest Hemmingway took on his excursions to Northern Michigan from Chicago. Coming north out of Byron Center, the trail runs between the two halves of Railside Golf Course. There are two of these graceful golf cart bridges over the path. 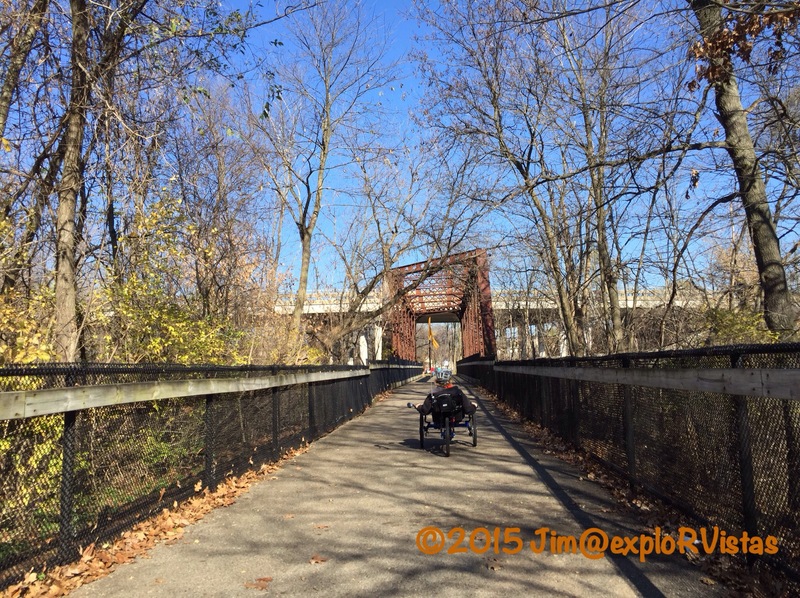 A few miles north, the trail goes under M-6, otherwise known as the South Beltline or the Paul Henry Freeway. We purposely are not political on this blog, but Mr. Henry’s legacy bears mentioning. Paul Henry was a Republican U.S. Congressman who oversaw the same district that Gerald Ford held when he was a congressman. From that office, Ford moved into the vice-presidency and then the presidency. Mr. Henry was known to vote with his conscience, even if it meant that he went against the rest of his party and President Reagan, which was quite remarkable in such a heavily Republican district. We had the pleasure of meeting him as he passed us at an outdoor cafe in Grand Rapids, and he was a true gentleman who was well respected on both sides of the aisle. He ended up getting a brain tumor and passing at age 51. During his tenure, this much needed highway was in the planning stages. 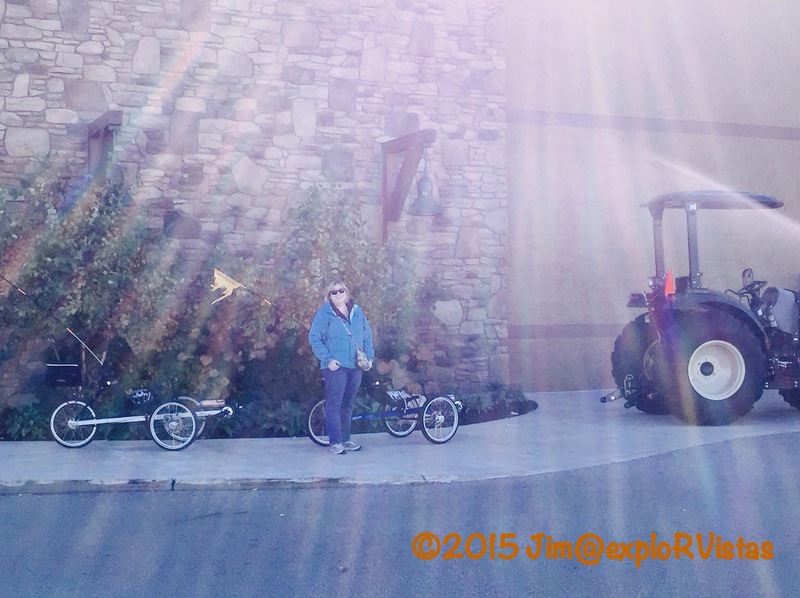 When we got to the five mile mark, we discovered that the trail passed by the new Cabela’s store in Grandville. We stopped for a little bit, then headed back the five miles to our truck. 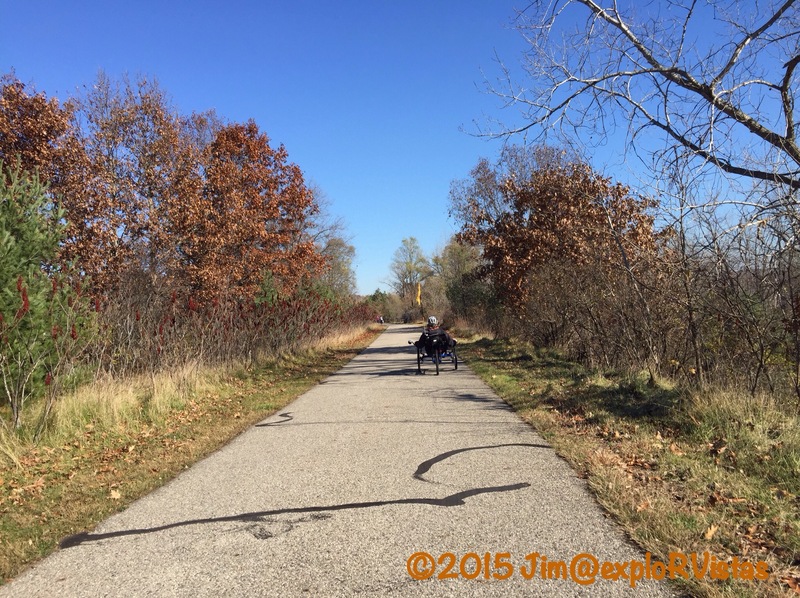 On Tuesday, we rode on the northern portion of the Paul Henry Thornapple Trail. 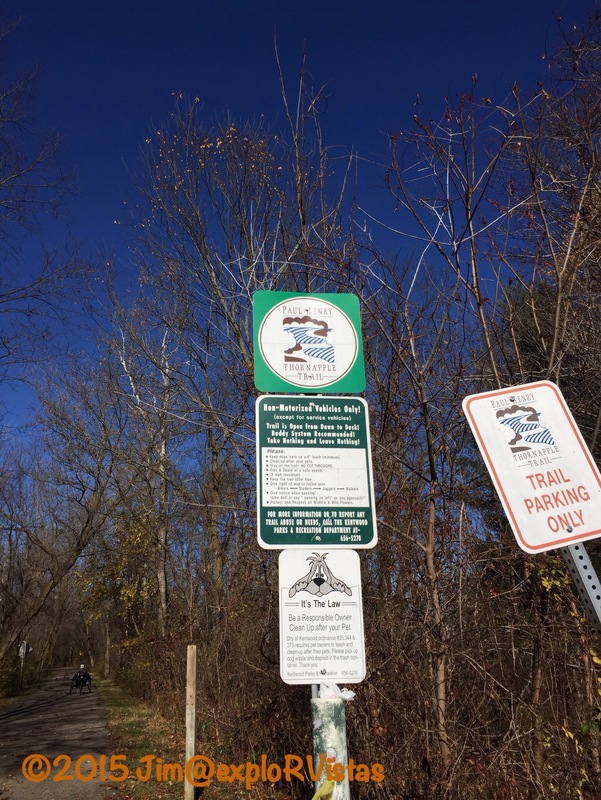 This particular trail is still under development, and runs along a former railroad between Grand Rapids and Vermontville to the southeast. When complete, it will be 42 miles long. 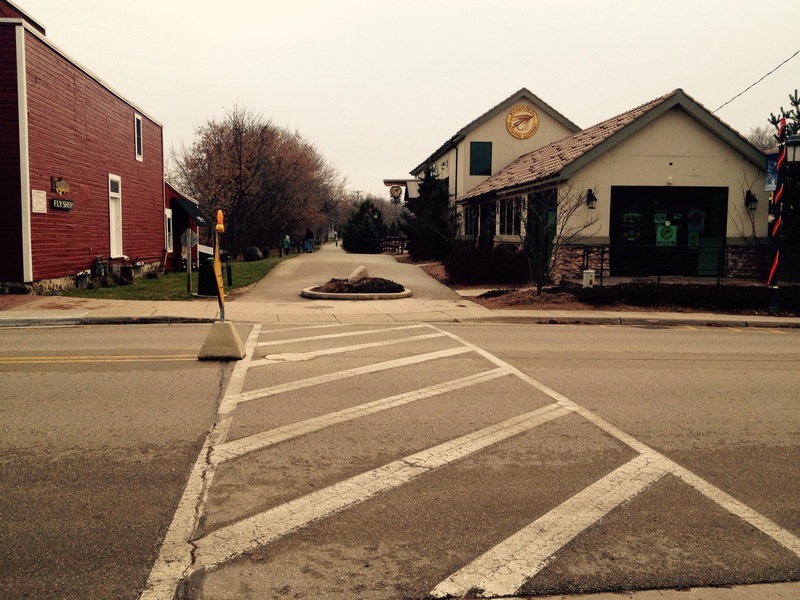 We started on the outskirts of town and rode north into Kentwood, a southern suburb of Grand Rapids. The trail was very nice. We did have to cross a five lane portion of 52nd Street, but it was at a traffic light. There was a nice city park with restrooms near that intersection. We came to an intersection with the East-West Trail and continued north on the Paul Henry Trail. The neighborhood started to get a little too urban for our taste, so we backtracked to the East-West Trail and checked it out. This is a fairly new route that runs along a series of high tension power lines through a Consumers Energy corridor. 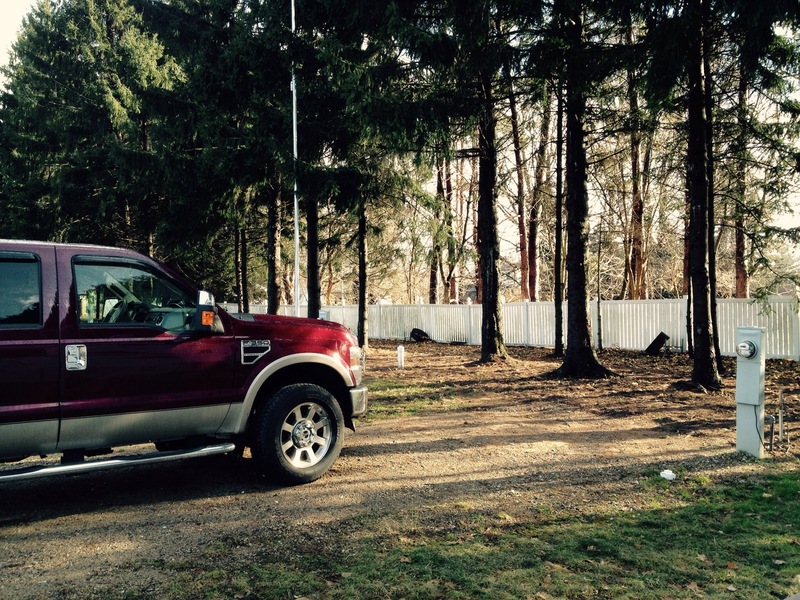 It’s definitely a suburban route, and is a great use of the land. This particular raised wooden path over a swamp was first rate! 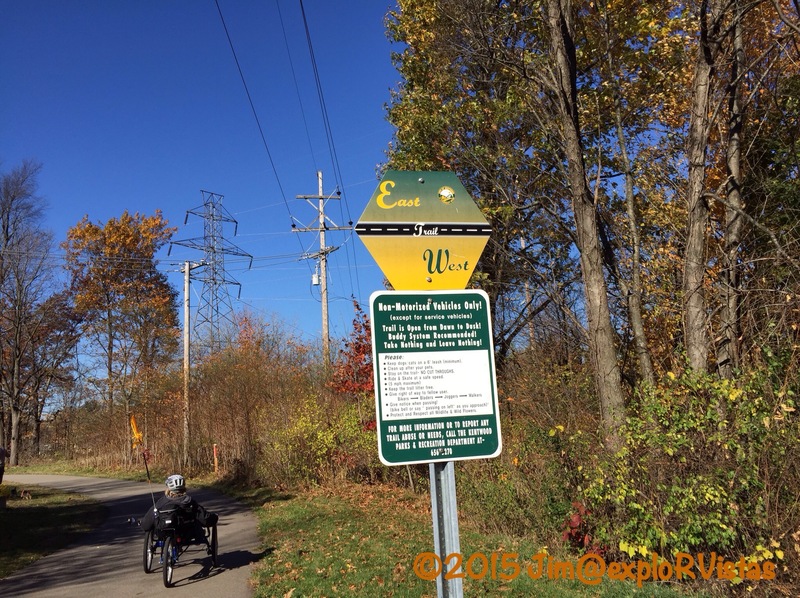 Kudos to Consumers Energy for partnering with the community on this trail! 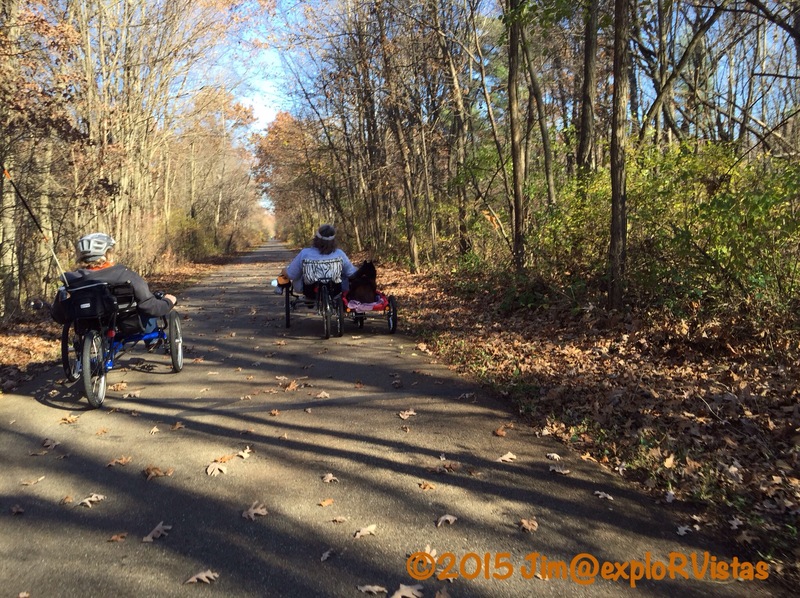 On Wednesday, we decided to check out one of the premiere trails in Michigan: The Fred Meijer White Pine Linear State Park. 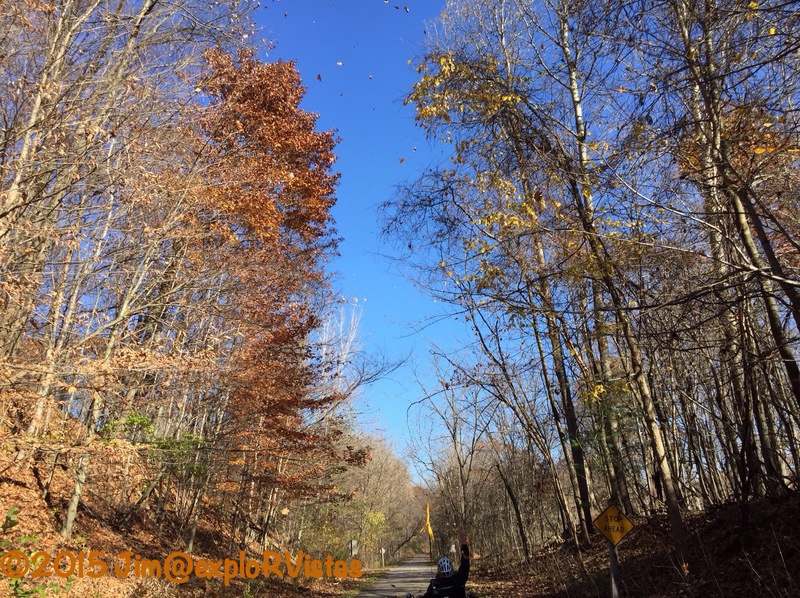 This trail runs along the same Grand Rapids and Indiana corridor that Kent Trails runs on, only the White Pine is from Grand Rapids north to Cadillac…a distance of 92 miles. The southern 22 miles is asphalt, with the rest being a hopscotch of asphalt and crushed limestone. We started out in the town of Belmont and headed north. In the parking lot, we had met this fellow TerraTrike owner who constructed this sidecar for her doggie. That was one happy puppy! The trail ran near the Rogue River, and there were several deep ravines. This particular portion of the railroad grade dates back to 1867. Just prior to passing under 10 Mile Road, the route crosses an old bridge over the river. It then runs through the quaint town of Rockford. 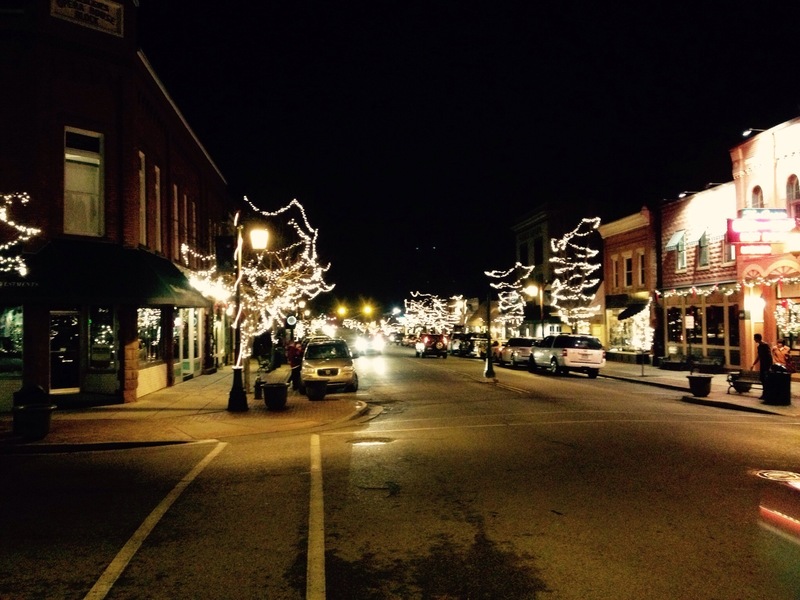 Longtime readers may recall our post from this town last December called ‘A Small Town Christmas’. 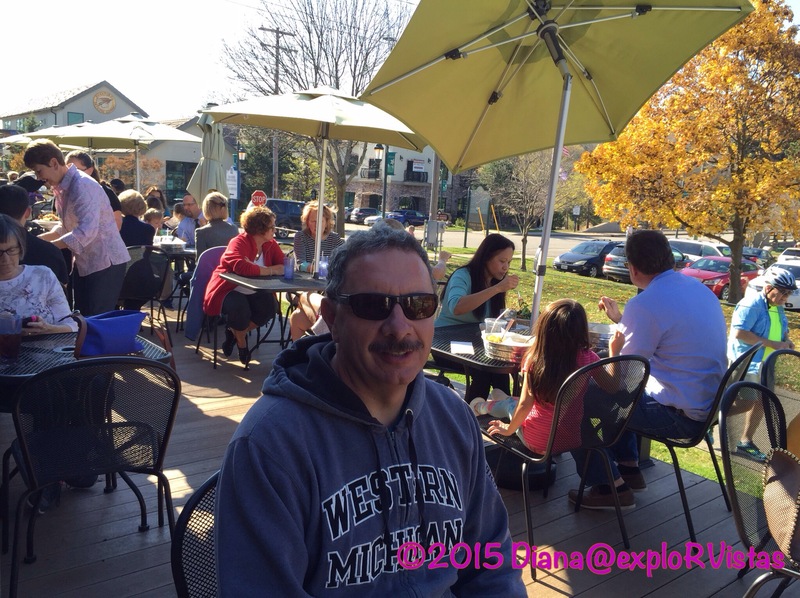 On this beautiful November day, the town was packed with people enjoying the sunshine. We had a trailside lunch at Ramona’s Table, which was delicious! From there, we continued north for a bit. 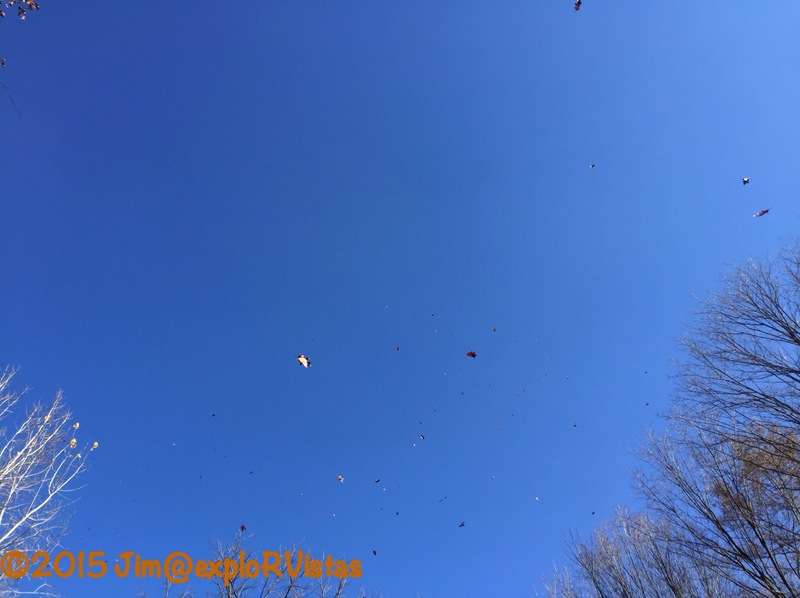 ….and the leaves appeared to be raining out of the clear blue sky! 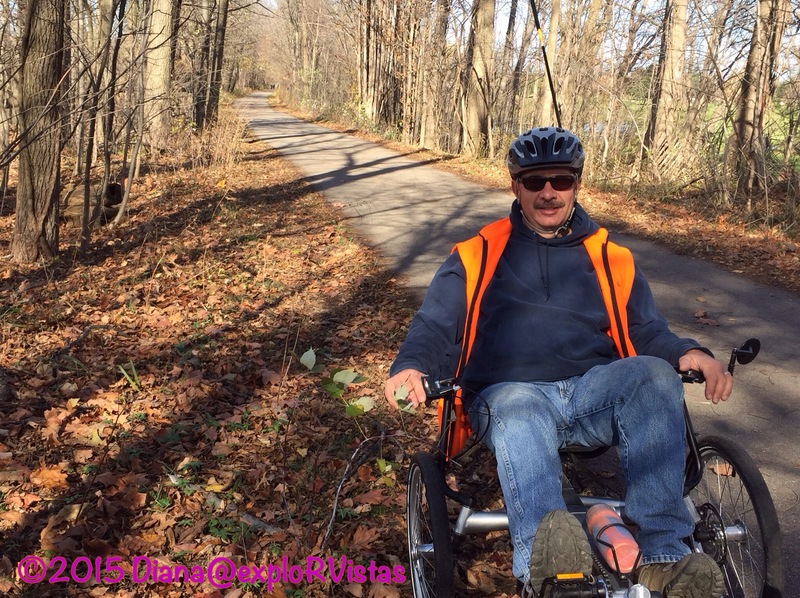 We ended up pedaling to 12 Mile Road, which was six miles from our starting point. We headed back and called it a day. These pathways are just a small sampling of what the area has to offer. 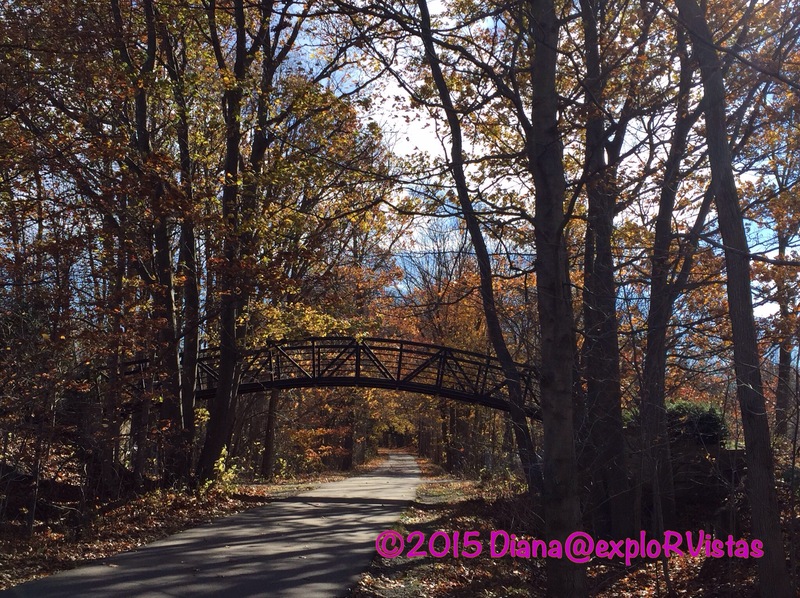 We look forward to exploring more of West Michigan’s trails in the future. Laughing our way into Spring! No better way to welcome Spring than with a whistle and a laugh! 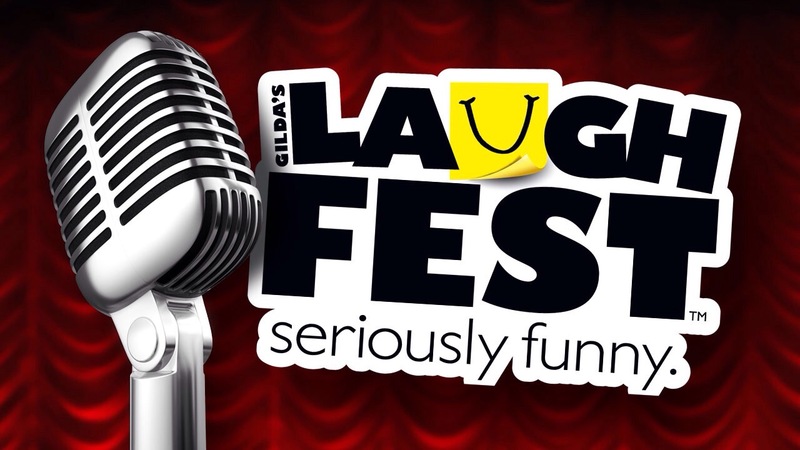 As stated in a previous post, we are volunteering this week at Gilda’s LaughFest in Grand Rapids. Last Saturday night was our first show. We are part of the ‘Front of House’ team, which entails either ticket taking or ushering. For Saturday’s show, we ushered on the main floor of Fountain Street Church. This photo shows the venue at a previous LaughFest event. The main act for our show was Billy Gardell, of Mike and Molly fame. As ushers, we did get to listen to some of the show. That was fun! I’m sure some folks are asking “Blue collar comedy in a church?” Well, Fountain Street Church (FSC) is quite unique. Founded in mid 1800’s as a liberal Baptist church in a very conservitave town, FSC has always pushed the envelope to the left. The congregation has become non-denominational, centering itself with spirituality over any affiliation with a set religion. Over the years, they have hosted speakers such as Clarence Darrow, Winston Churchill, Eleanor Roosevelt, Robert Frost and Malcolm X. They have had performers such as Duke Ellington, Frank Zappa, The Grateful Dead and U2 take to the sanctuary. So to host LaughFest shows for a good cause is not a stretch at all for FSC. ﻿And the gigantic neo-Romanesque building is a spectacular setting. If you ever have the opportunity to tour Fountain Street Church, do so. The stained glass is outstanding, and quite unique. The opening act was Dale Jones. We were still fairly busy seating latecomers during his show, so we weren’t able to concentrate much on his act. From what we did see, he was extremely funny and was quite physical in his comedy. We definitely would like to see him again sometime. Near the end of his performance we were told to fan out, as that is when the cameras would come out for Billy Gardell. Per his wishes, no photography was allowed. Billy hit the stage and the first word out of his mouth was the ultimate expletive. He then looked up into the rafters, grinned and said “Just checking”. The irony of doing his act in a church wasn’t lost on him. 🙂 We had about 15 minutes of people trying to take photos before they settled in and enjoyed the show. While still doing our jobs, we did get to catch most of Billy’s act and he was hilarious! On Sunday, the weather decided that it would get in sync with the time change. We had our first temperatures in the 40’s since January! 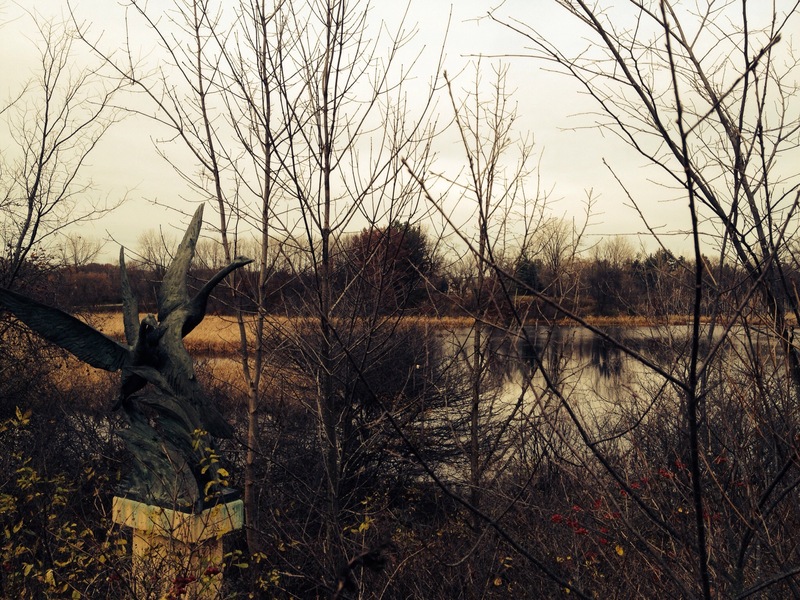 The sun was out, the sky was blue, and we headed out to Blandford Nature Center in Grand Rapids for a stroll. The birds were singing like crazy. Check out this Downy Woodpecker working away on a branch. Mr. Squirrel was having a blast hopping from tree to tree. And the buckets were hanging from the taps on the maple trees, gathering sap in preparation for the spring maple syrup production that Blandford hosts. A sure sign of Spring! Our temperatures are forecast to be in the 40’s and 50’s for the next 10 days, so that should take care of most of our snow. That ice we have been showing you on Lake Michigan will take a long time to melt, so our temps inland will be better than those at the lakeshore. 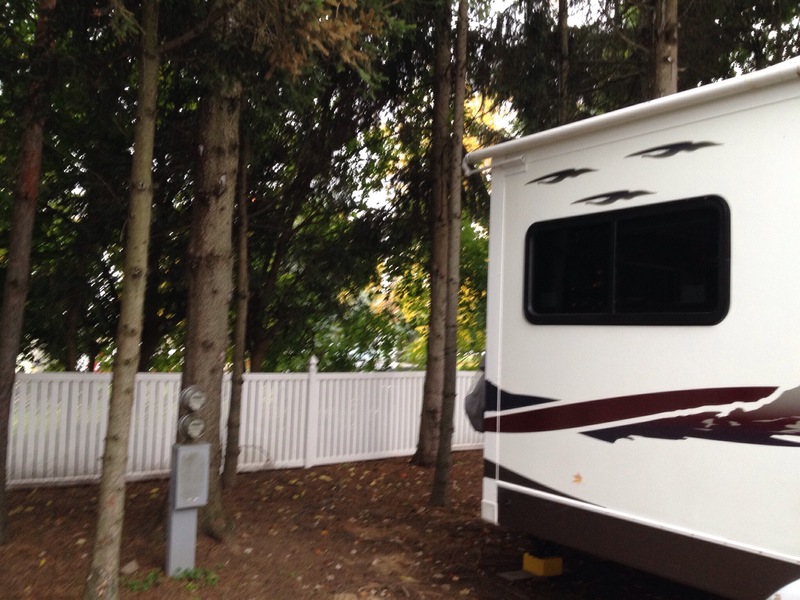 Our propane usage has gone way down…thank goodness…and it won’t be too long before we shed the trailer skirting and the plastic on our windows. Michigan has a way of surprising us with late season snow, so we will hold off on those projects for a bit. In the meantime, we will be whistling away, totally oblivious to our soggy sneakers! 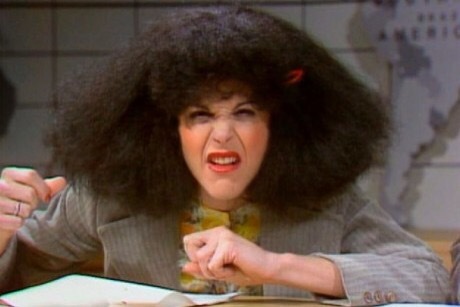 Very few of us over the age of 40 are unaware of Gilda Radner, that hilarious spark plug of a woman who tore up the airwaves each week on Saturday Night Live. With her characters such as Roseanne Roseannadanna, Emily Litella, and Baba Wawa, she found a way to our collective funny bone on SNL with every performance. Little did we know at the time, she was to only to be with us for a short time. Ovarian cancer took her from us at an early age, as that awful disease so often does in the families it touches. 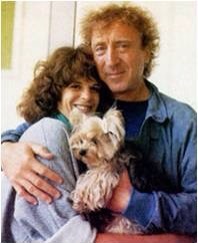 Gilda was married to Gene Wilder at the time of her death. Upon her passing, Gene wanted to leave a lasting legacy to her. One of the things Gilda was quoted as saying was ” Having cancer gave me membership in an elite club I’d rather not belong to”. So with that in mind, Wilder teamed with Joanna Bull and Joel Siegel to form Gilda’s Club in New York. The purpose of the ‘club’ was to provide a place where people touched by cancer could go for information, guidance, to talk, cry or (most importantly) laugh. Before long, Gilda’s Clubs opened all over the country. 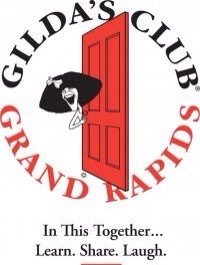 GIlda’s Club opened a chapter in Grand Rapids in 2001. 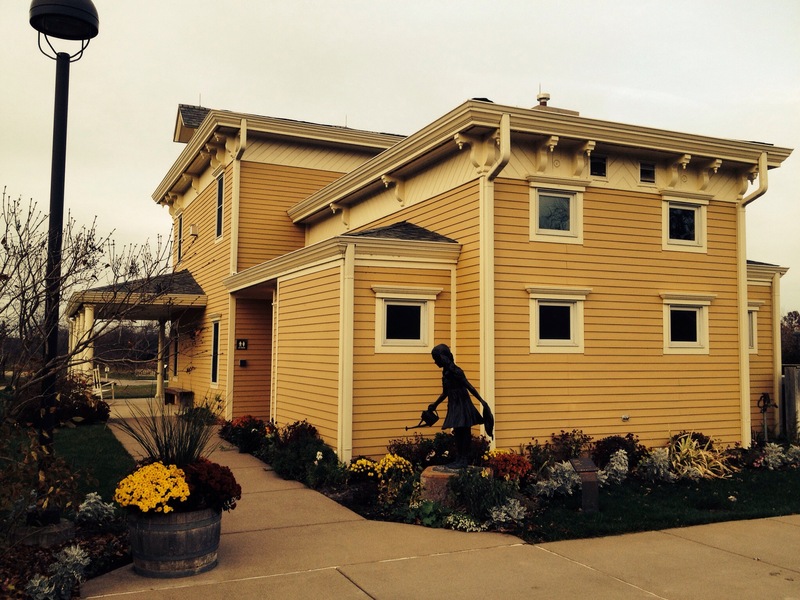 It is located in a restored farmhouse in a peaceful setting at the outskirts of downtown Grand Rapids. Gilda’s Club of Grand Rapids offers cancer, grief and emotional health support for children, adults, family and friends. People with cancer and their families can come and go as they please, to seek out comfort and compassion as they work their way through their journey with the disease. They also offer community outreach and in-school programs. 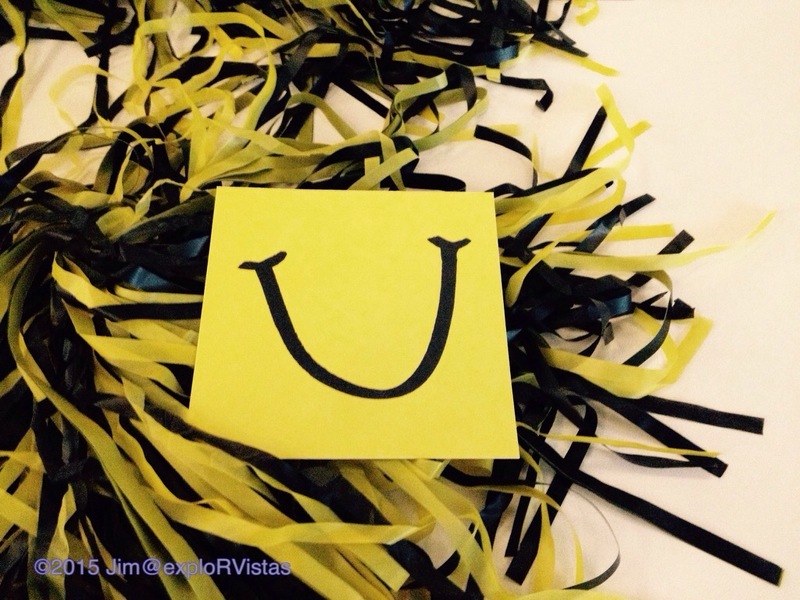 People are encouraged to give themselves permission to smile again…something Gilda referred to as ‘finding her funny again’. We were invited to GCGR by Sister Sue Tracy to hear her speak. Being surrounded by other cancer survivors let us know that we were not alone. We were first introduced to Sr. Sue when she, in the role of chaplain at Spectrum Health, sang Christmas carols with my extremely ill mother. 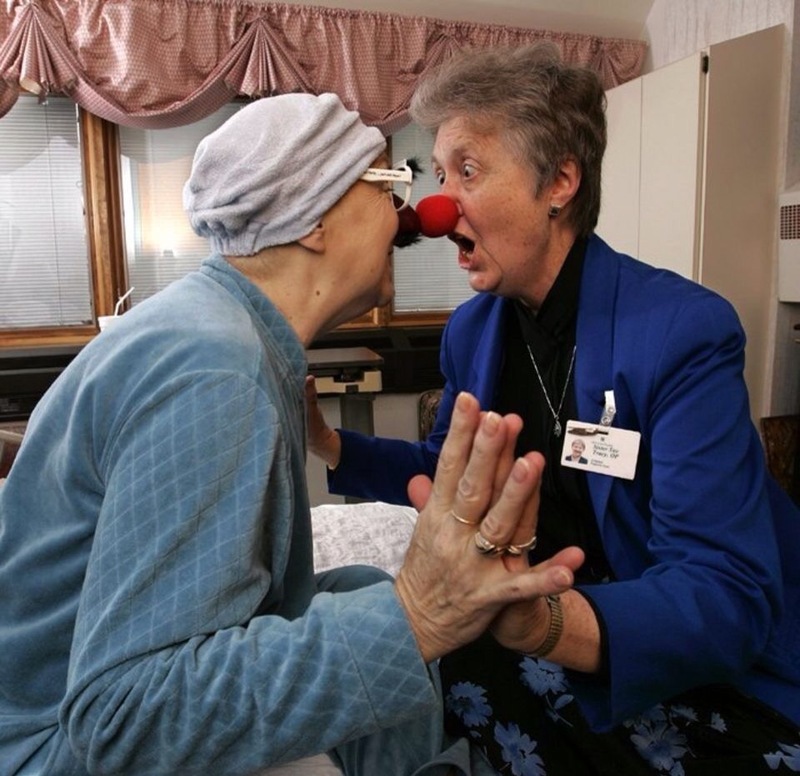 She will go to any length to get patients to laugh, and is a joy to be around. 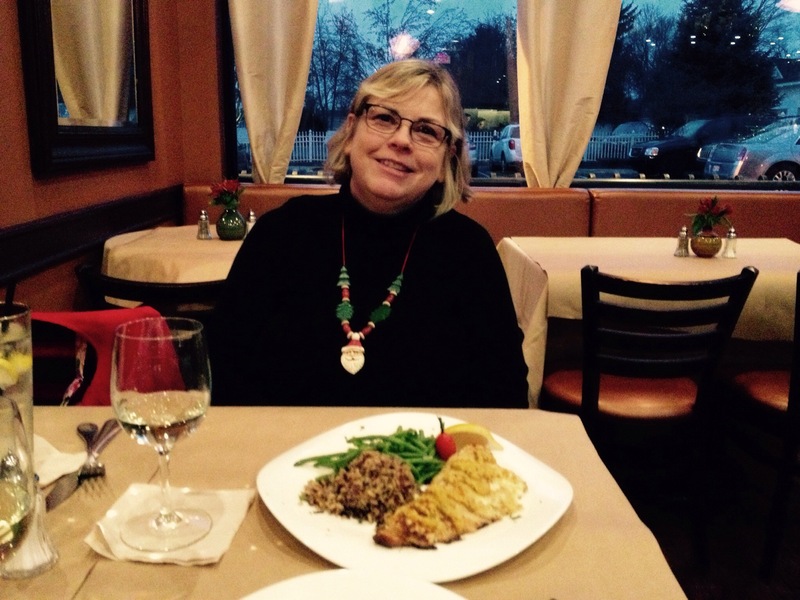 She is in her 5th battle with cancer…yes, I said FIFTH. I have had the pleasure of walking laps with her at the downtown YMCA on occasion. She once told me that she was invited to speak on Mackinac Island and was given a beautiful room with a king sized bed. But the real bonus was that there was two mints on the pillow and she got to eat them both. She then told me “Jim, there ARE benefits to being celibate!” What a great lady. If anyone deserves sainthood, it is undoubtedly Sr. Sue. With Gilda’s Club being free of charge for the people it serves, they rely on donations to keep them going. In 2011, they launched LaughFest, a 10-day comedy festival in March. Quite honestly, Grand Rapids usually needs a reason to laugh by March! This is but one way they seek to fund their programs. That first year saw 642 artists on 49 stages around town, and included names like Betty White, Bill Cosby, Margaret Cho, Kevin Hart and Gabriel Iglesias. It was a huge success. 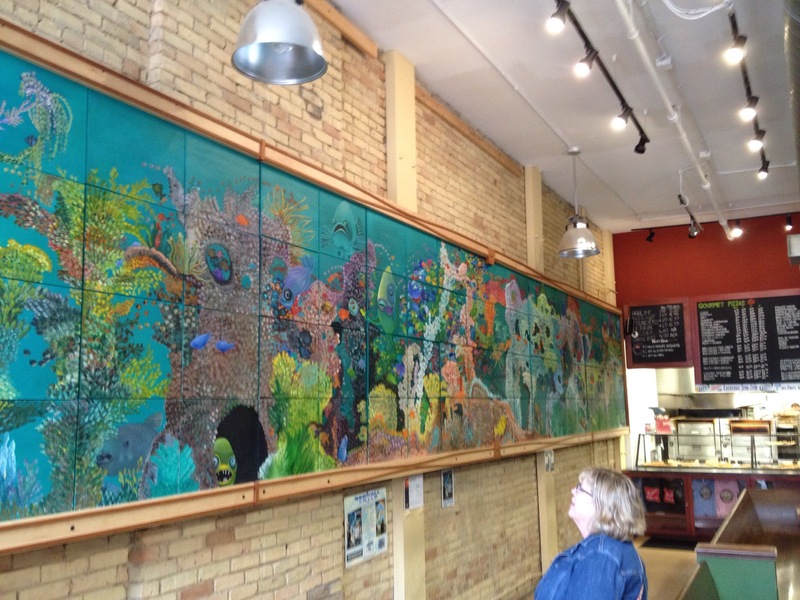 Each year has brought more talent to town, and the festival has spread throughout the entire metro region. This year, the headliners are Wanda Sykes, George Lopez, Billy Gardell and Colin & Brad from ‘Who’s Line Is It Anyway?”. 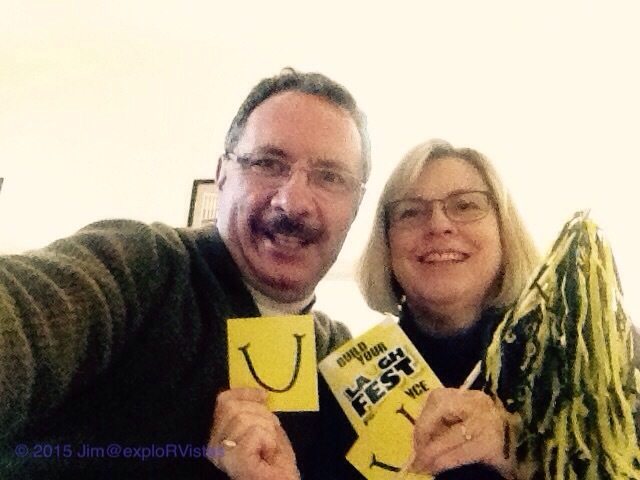 LaughFest will have somewhere in the vicinity of 900 artists. Obviously, a festival of this size requires an army of volunteers. Count us in! With us being retired, we decided to give back to the community for all the support we received though our journey with my cancer. 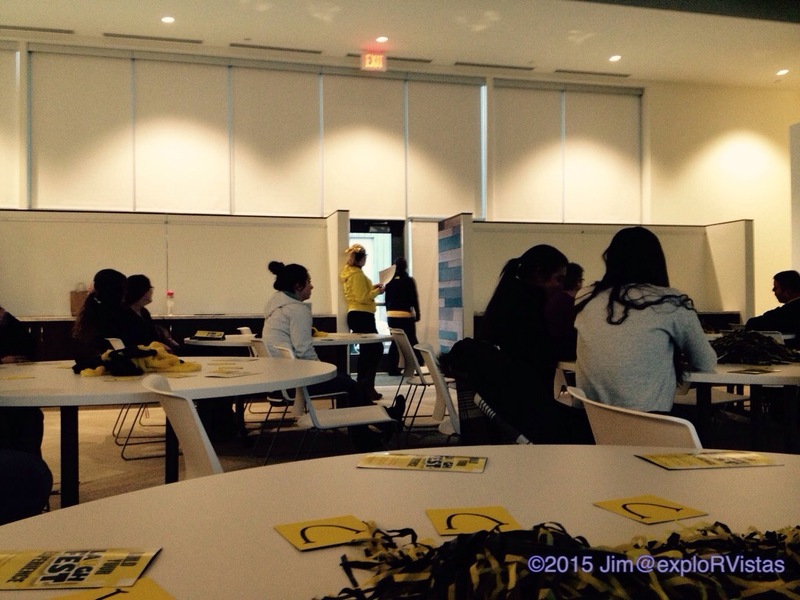 We attended a meeting last night for new volunteers. By the time the meeting started, this room was packed. Next week, we will meet with the specific group we will be working with, namely ‘Front of House’. We will sign up to work events over the course of the 10 days of LaughFest, and will do things like taking tickets, ushering, greeting patrons and so on. 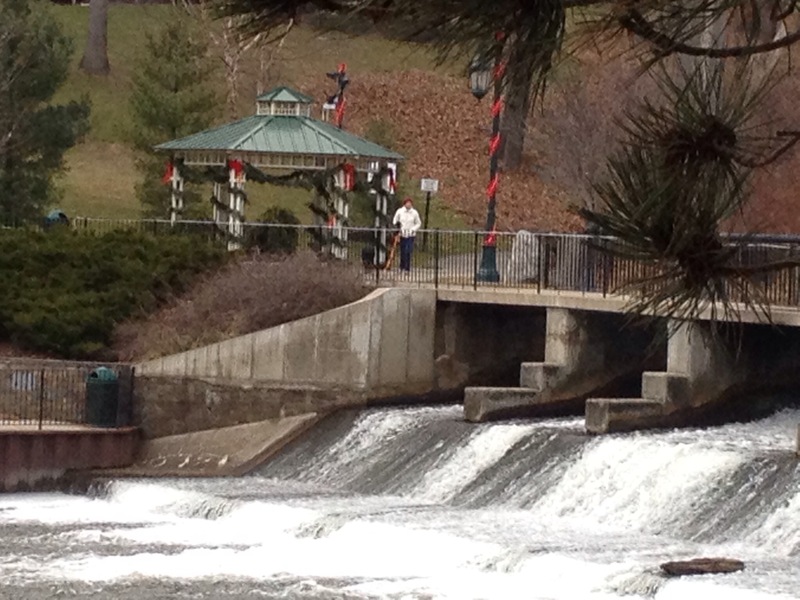 Just north of Grand Rapids is the small town of Rockford, Michigan. We drove up there this week to wrap ourselves in a little holiday spirit. 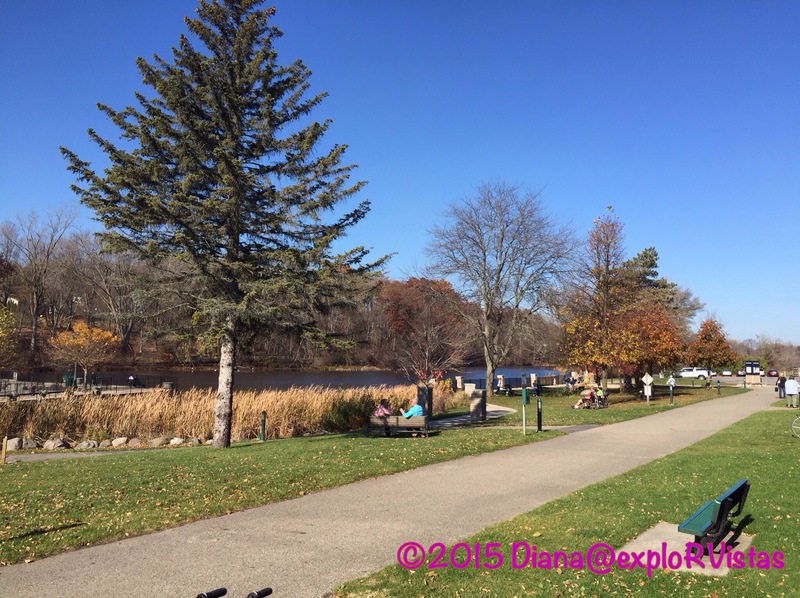 Rockford is a city that is being enveloped into the outer reaches of the Grand Rapids metropolitan area, yet its’ downtown retains the small town charm of years long past. Coming into town, a banner over the road proclaims “Welcome Home For The Holidays”, and Rockford really lives up to that statement. The town was originally named Laphamville in the 1840’s after Smith Lapham, who helped construct the first sawmill dam on the Rogue River at that spot. When the Grand Rapids and Indiana Railroad came through in the 1850’s, they proposed a shorter name. 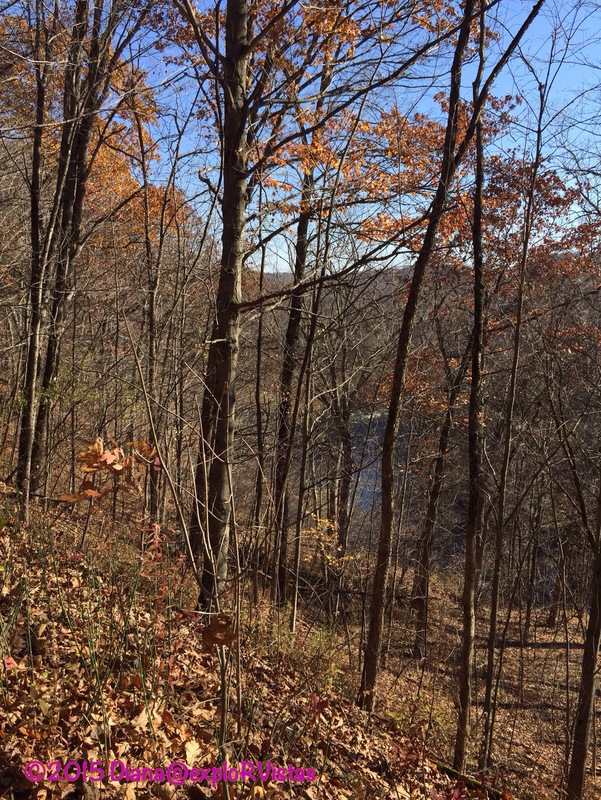 A former resident of Rockford, Illinois spoke up and proposed they name the town after his former home, citing the ‘rocky ford’ below the dam. And just like that, Rockford, Michigan came to be. Rockford is known as being the headquarters for Wolverine Worldwide, better known for its’ primary brand, Hush Puppies. While the manufacturing facilities have left town, the corporate offices are still here. The streets are lined with unique shops. 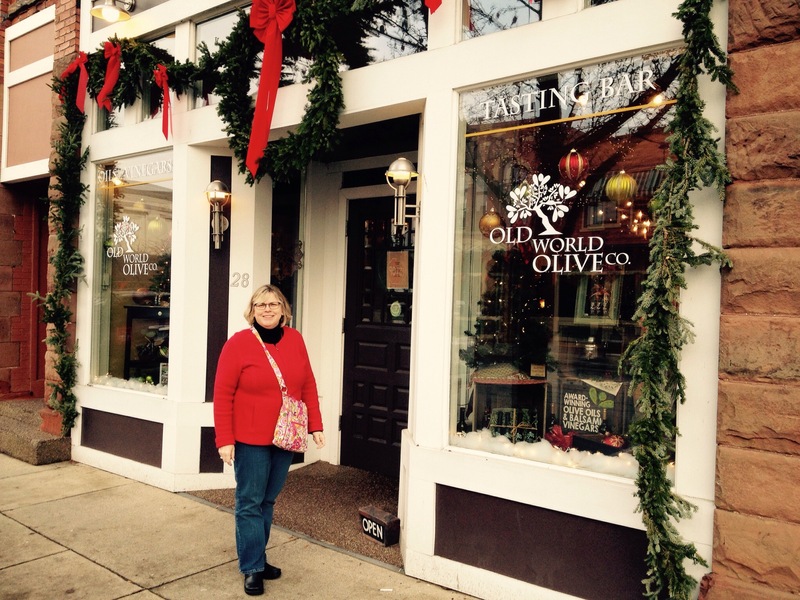 One place we had never visited was Old World Olive Company. We knew that one of our fellow RV-Dreamers had owned a similar shop in California, so we stopped in to check it out. 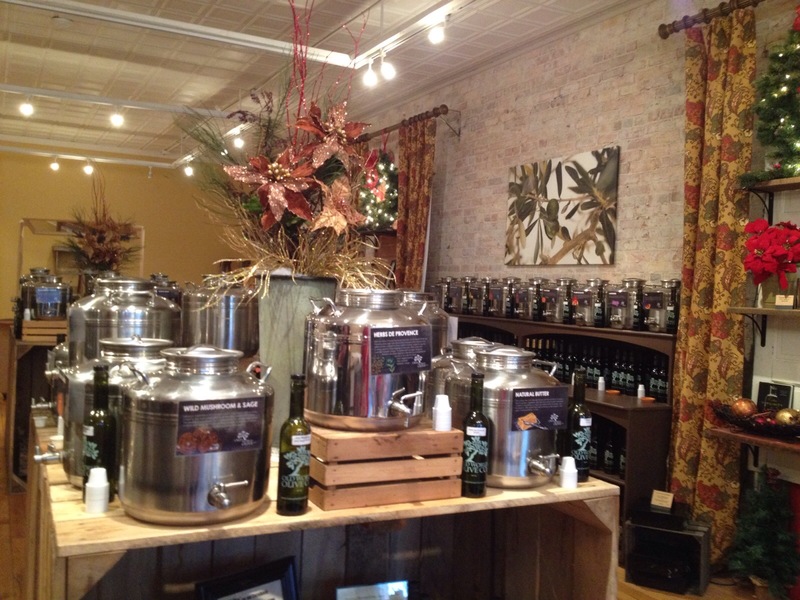 While the olive oils were good, it was the balsamic vinegars that knocked our socks off. We purchased a Vermont Maple vinegar and a Mandarin Orange vinegar. 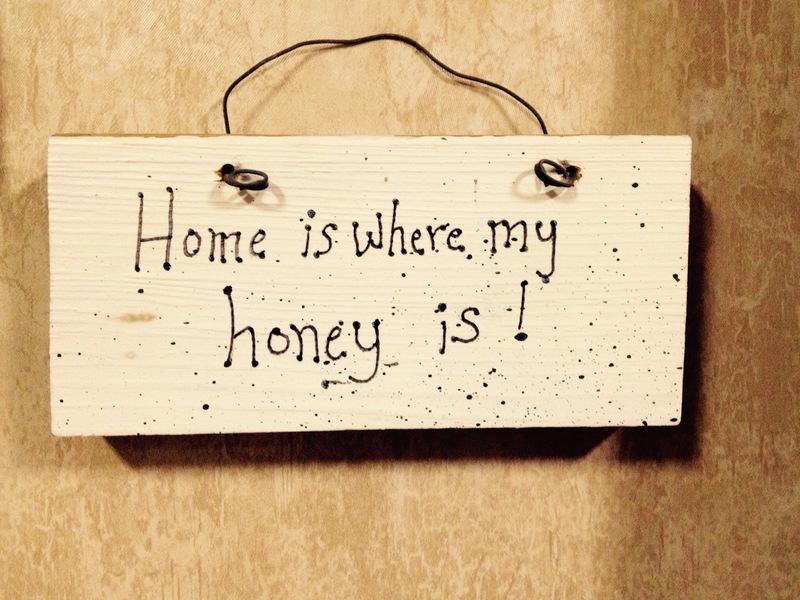 That was a nice little gift to ourselves to use in our RV. One of the other stores in town had a rack full of red flannel underwear. 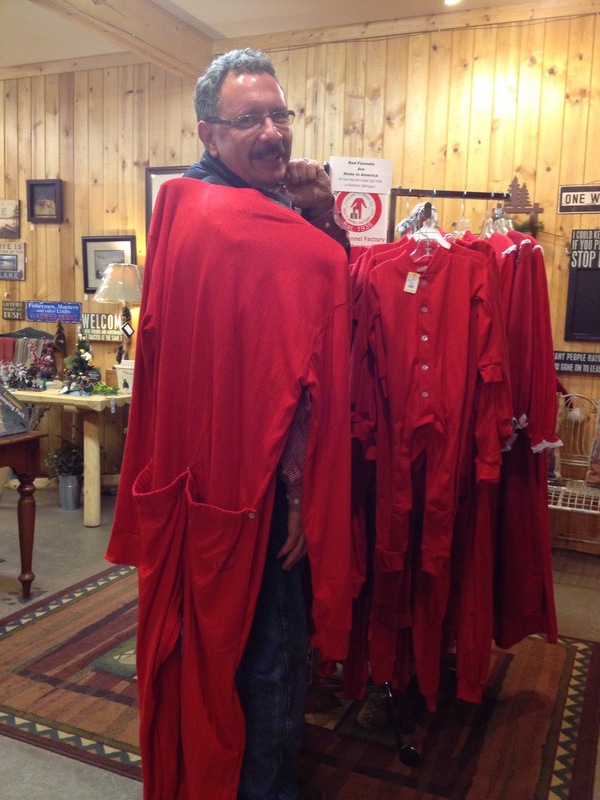 The next town north of Rockford is Cedar Springs, better known for its history of making these crimson garments. The Red Flannel Festival is held there every year. They really do paint the town red! 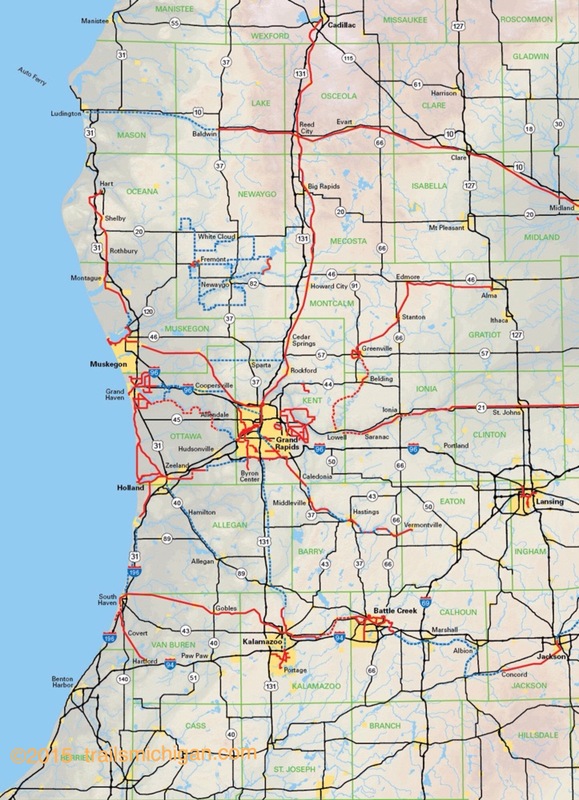 As mentioned earlier, the Grand Rapids and Indiana Railroad once ran through Rockford. At its height, the railroad ran from Cincinnati, Ohio to Mackinaw City, Michigan. 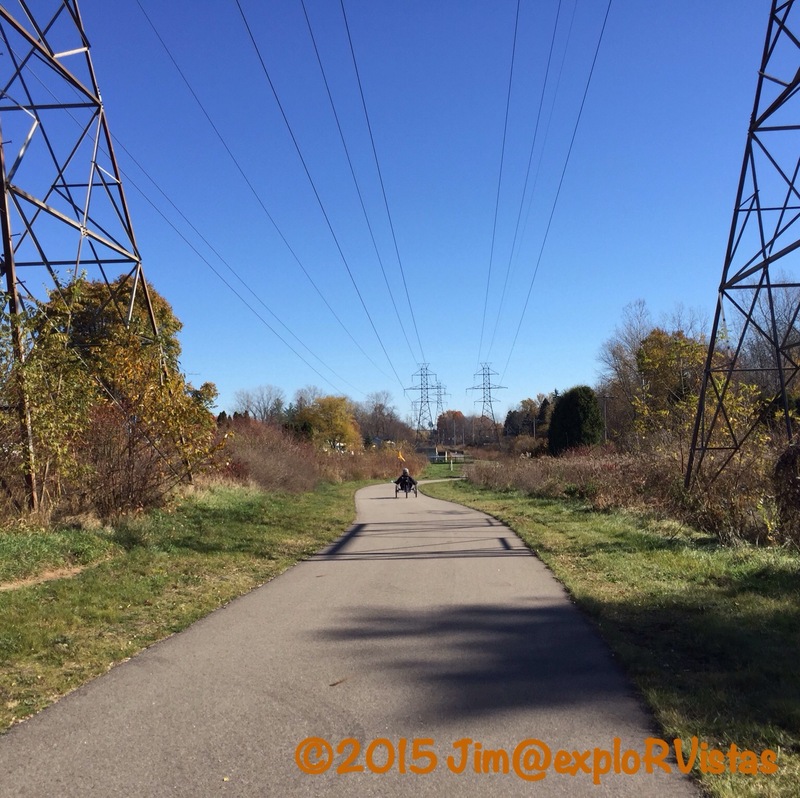 While most of that railroad ceased to exist, a good portion of the rail bed has been turned into various bike trails. The longest of these, the Fred Meijer White Pine Trail Linear State Park, runs 90 miles from Grand Rapids north to Cadillac, Michigan. It runs directly through the heart of Rockford. Many of the folks who live in Rockford and work in Grand Rapids use the trail in the summer to commute to and from their jobs. Most of the trail is asphalt, with some of the northern sections being crushed gravel. For dinner, instead of hot dogs, we opted for Grill One Eleven. This has been a favorite of ours for a few years now. Diana opted for the walleye. She has had their Reuben in the past, which she loves. 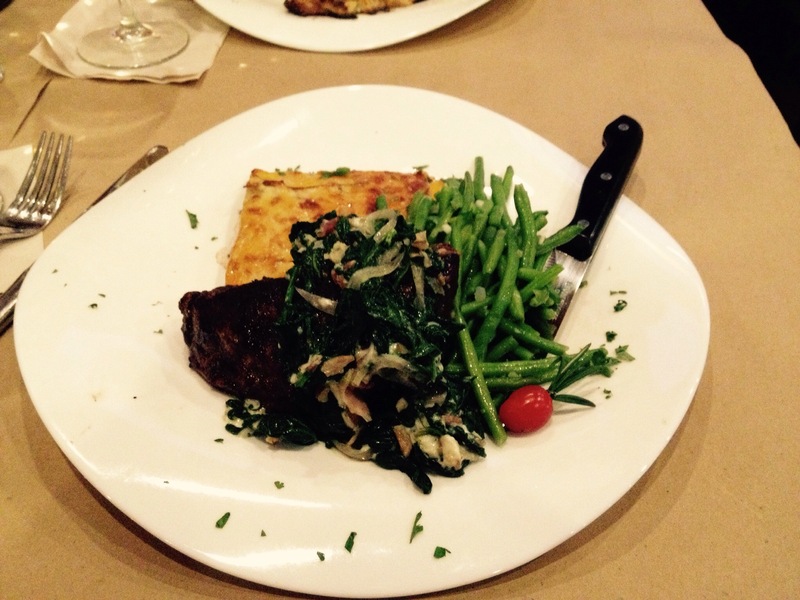 I chose the gluten-free version of the Rogue River Rockafeller, which was basically a steak with scalloped potatoes and vegetables. But, as you can see, that description did not do it justice. It was outstanding. By the time we left the restaurant, the sun had set. On our way back to our vehicle, we were treated to a dazzling display of Christmas lights in the trees. It was a nice ending to an enjoyable afternoon, and a good break from caregiving for Diana. Happy Holidays to all, if we don’t post before then! West Michigan is blessed with more than its share of philanthropists who give back to their community. None was more loved than Frederik Meijer. Fred, as everyone in town referred to him, was the son of Henderik Meijer, a barber turned grocer from Greenville, Michigan. Fred started out working at his dad’s store at age 14, bagging groceries. Eventually, he took a liking to one of the cashiers, Lena Rader, and they were married. Fred took over the company from his dad, and he pioneered the one-stop shopping big box concept in 1962…long before Walmart used the model. He grew Meijer into a huge regional player, with over 200 supercenters in 5 states. Along the way, he became the 60th richest man in America. But the chain itself was not the true measure of this man. It was his deep commitment to his employees and his community. He considered his workers to be his family, and he was truly concerned about their well-being. It was not unusual for a worker to head into the break room to find Fred there in a flannel shirt and jeans, asking how they were doing. This would happen day and night, as Meijer is open 24 hours. He would pop into hospital rooms to visit, or call and follow up if he couldn’t personally be there. He would show up at funerals, sharing hugs and tears. His focus was always on what he could do to improve the employee’s lives, not what the employee could do to improve the bottom line. 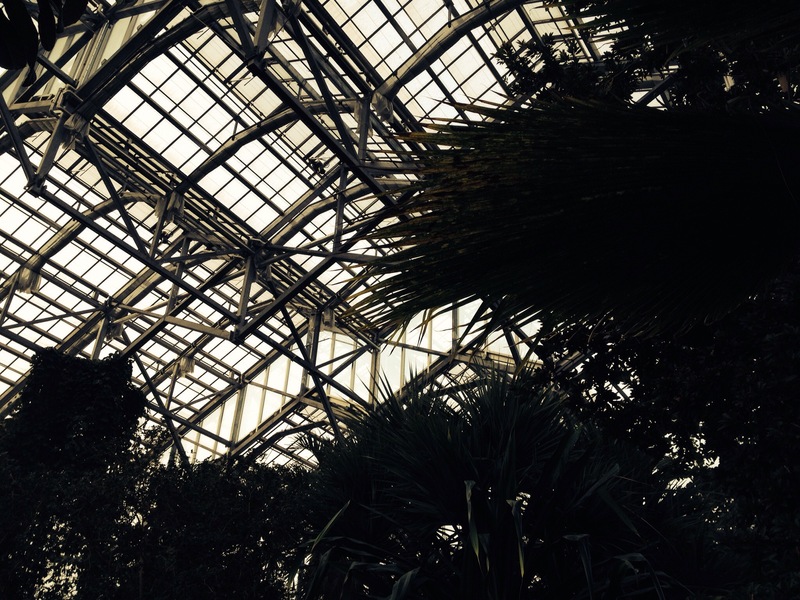 One of Mr. Meijer’s greatest gifts to his community was the Frederik Meijer Botanical Gardens and Sculpture Park in Grand Rapids, Michigan. 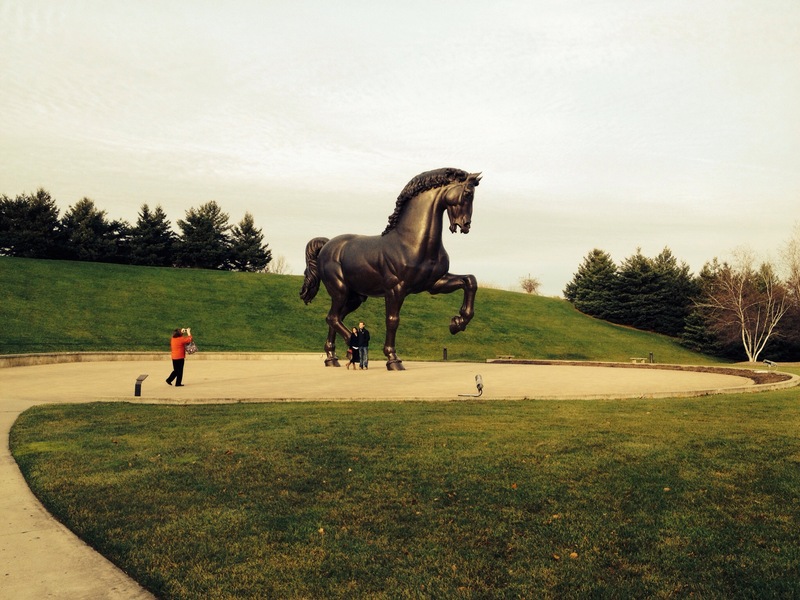 This world class facility has become the top tourist attraction in West Michigan. There are many facets to this amazing place, and it continues to grow each year. 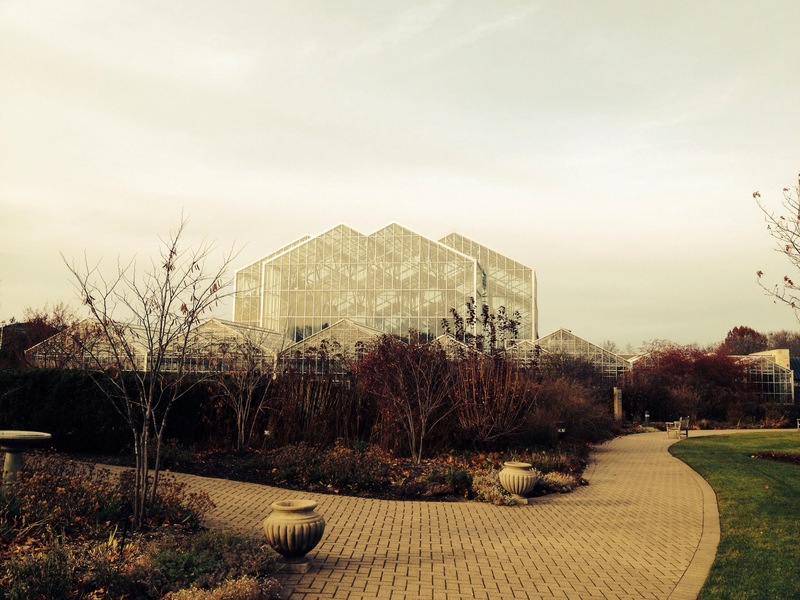 A visit to Meijer Gardens begins with the greenhouse. 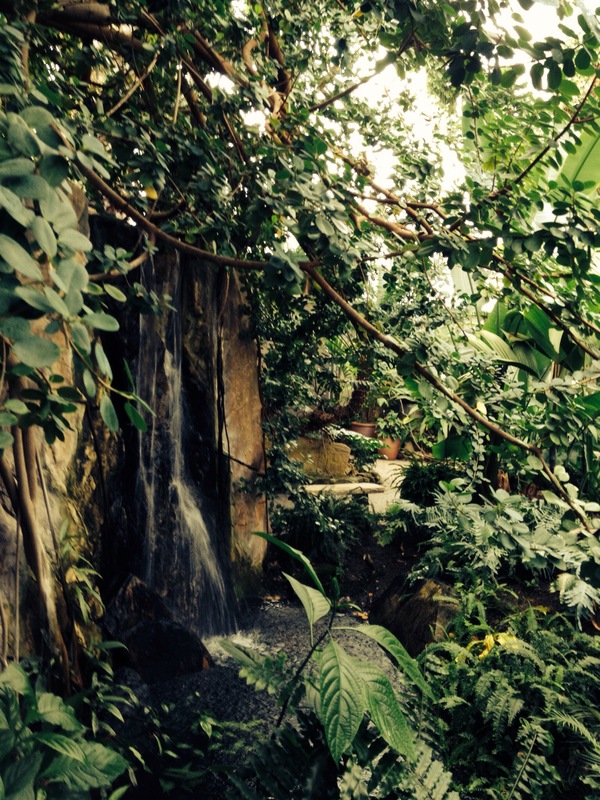 There are several temperate zones represented, with the largest zone dedicated to the tropics. This is a great place to go on a cold winter day. If a visitor is wearing a winter coat, it usually comes off, as it is that hot and humid. The real magic begins when you step out the back door. 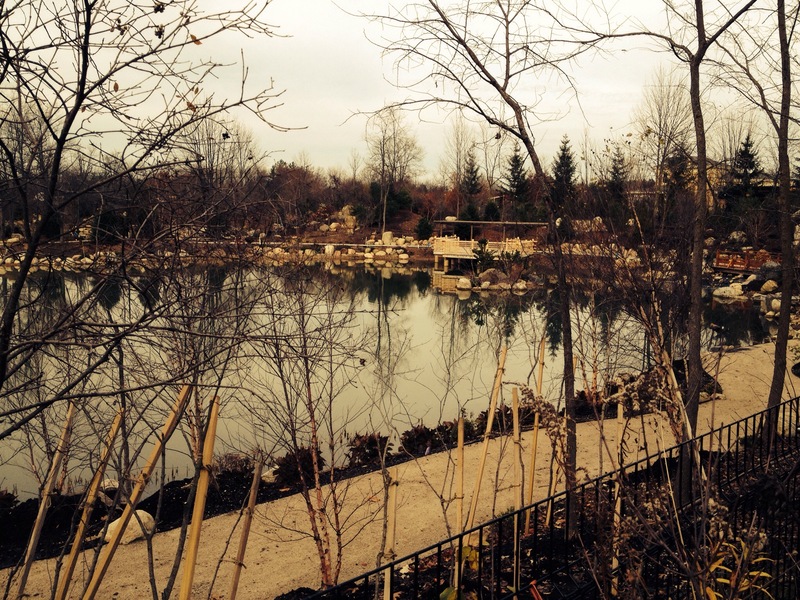 That is where the outdoor portion of Meijer Gardens begins. 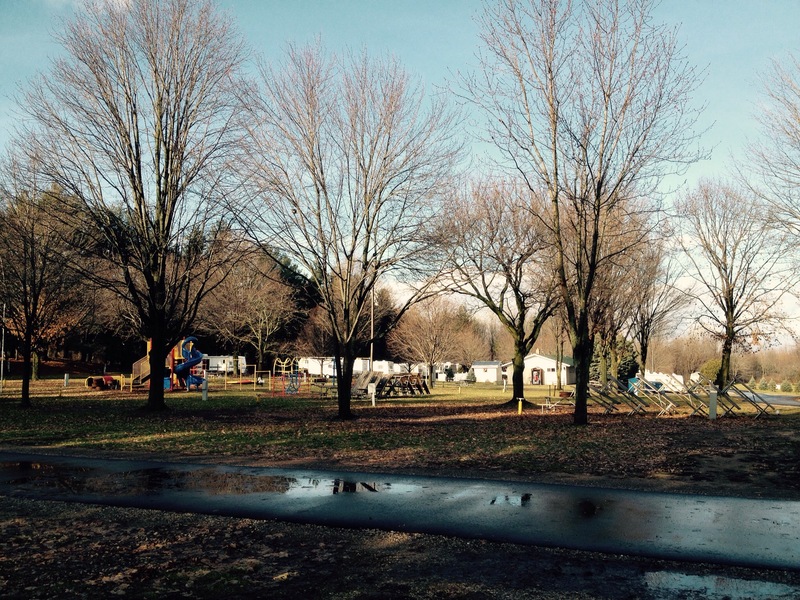 The current footprint of the park is 132 acres, and promises to grow as additional land is purchased. 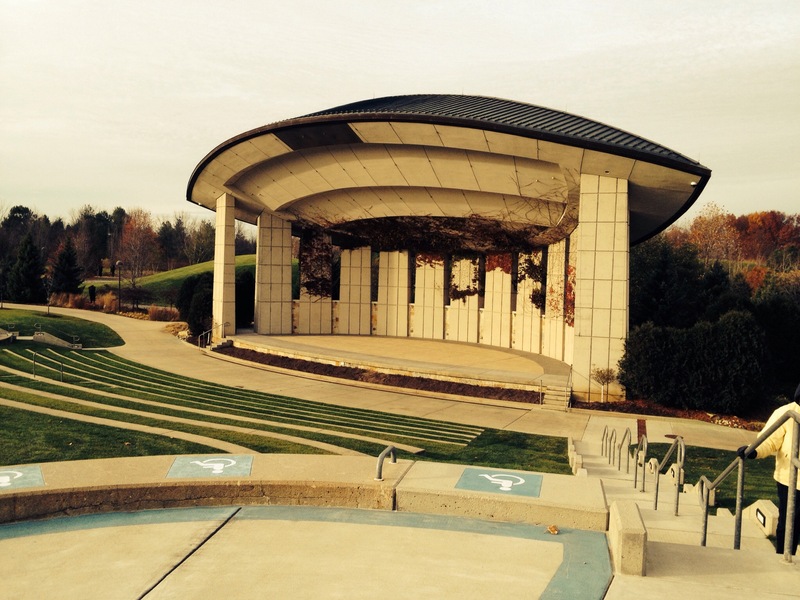 One of the first things encountered is the Amphitheater. 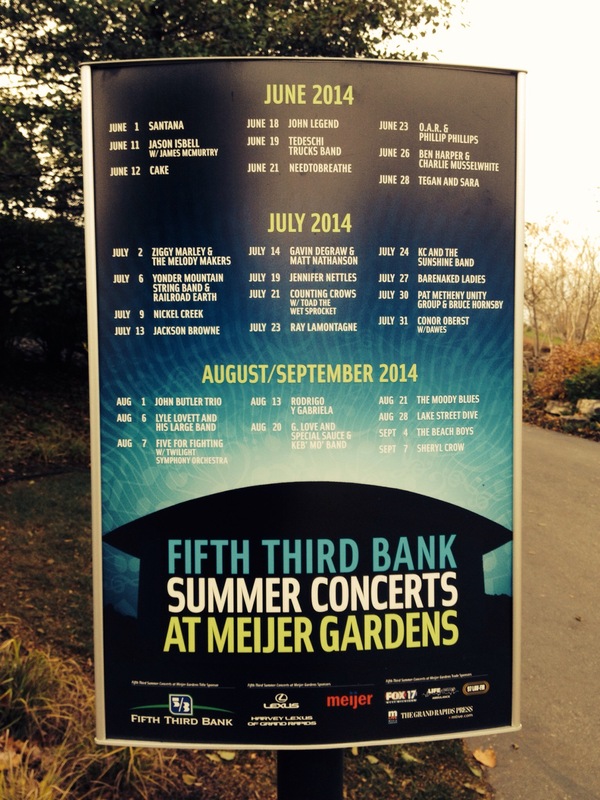 This venue hosts a summer concert series…members to Meijer Gardens get first dibs at tickets. With this type of lineup, it is a nice perk. It is a great way to spend a summer evening. We have seen Harry Connick, Jr., Mary Chapin Carpenter, Steve Martin and Lyle Lovett there. People bring wine, cheese and all sorts of gourmet delights. Another membership perk worth mentioning is the reciprocal agreement with over 200 other museums and gardens throughout the country. Our membership gets us into all of them. 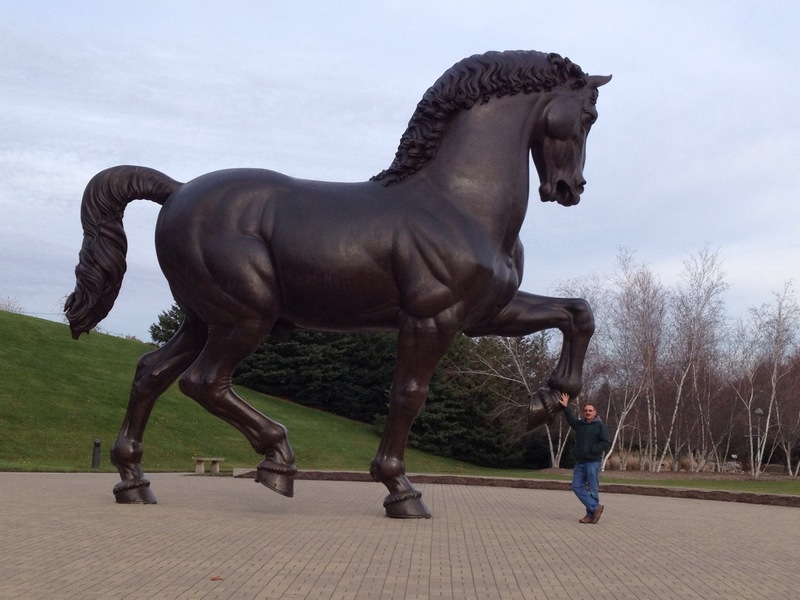 Following along the path behind the amphitheater, The American Horse appears. 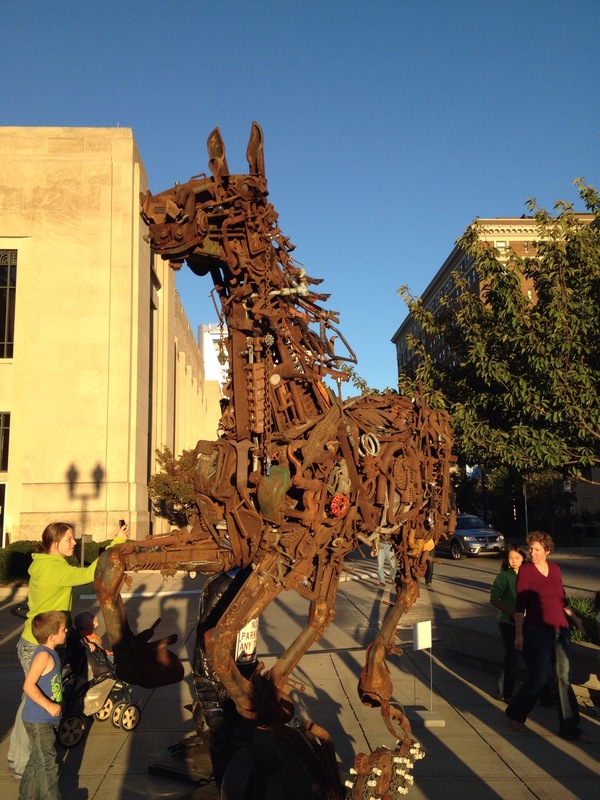 This is a 24 foot tall colossus sculpture based on Leonardo DaVinci’s lost work. Efforts to recreate his masterpiece in the making began in the latter half of the 20th century, and were finally funded by Frederik Meijer. Two identical castings were made; one for Milan, Italy and one for Grand Rapids. The sheer size of it is remarkable. The grace it exhibits as it stands on two of its four hooves is a thing of beauty. Beyond the horse, paths wind through several different types of zones; woodlands, prairies, wetlands and such. Throughout each zone, sculptures are interspersed into the flora. Lena Meijer has always admired formal gardens. Fred and Lena also had a love of Japanese gardens, and Fred wanted to give Lena one for their park. He enlisted the help of Helen and Richard DeVos (of Amway fame), and a new addition to the sculpture park is being built. This is no small undertaking. 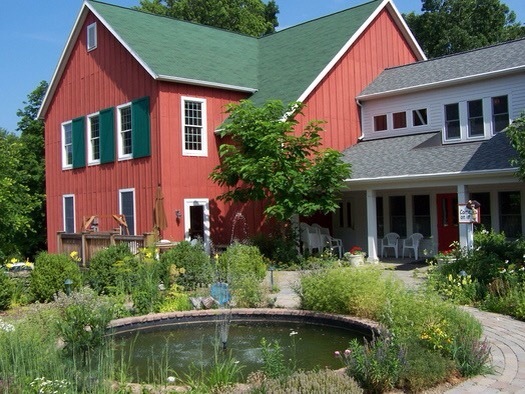 The garden spans 8 acres, encompassing a 2.5 acre pond. The workers were brought in from Japan, so this feature to Meijer Gardens promises to be the real deal. It is slated to open in June, 2015. 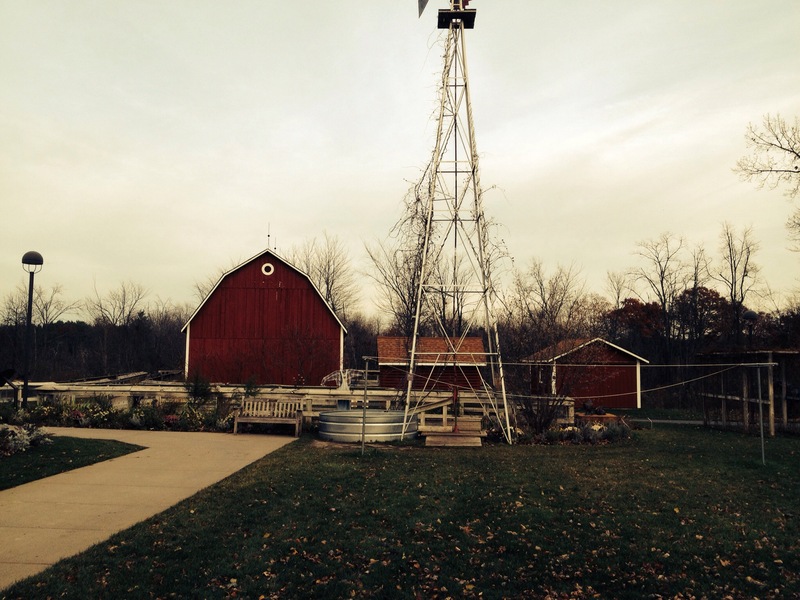 Beyond the Japanese garden is a Michigan farm. The house is a 3/4 scale reproduction of Lena’s childhood home. Barnyard animals are actually bronze sculptures, and the garden behind the farmhouse is tended to as any other garden would be. 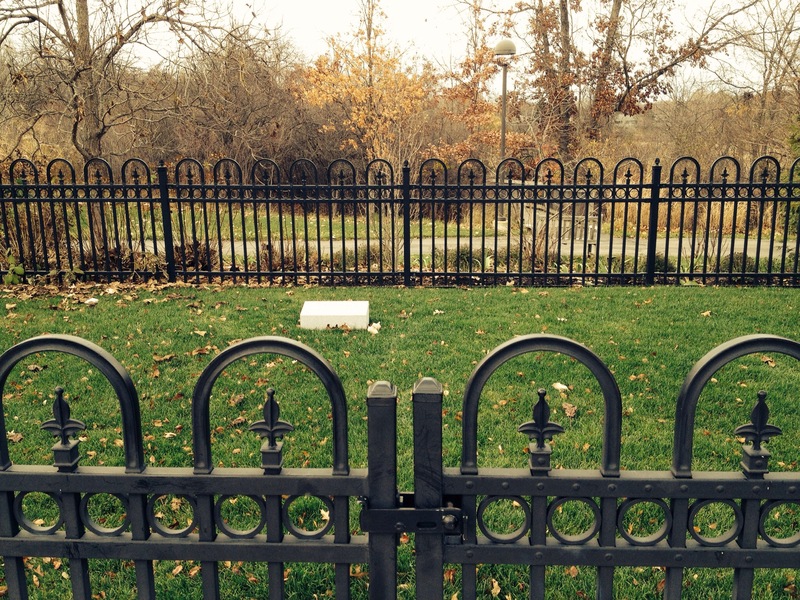 It is here that you will find the final resting place of Frederik Meijer. Lena will join him here someday. A humble stone for a humble man. Fred Meijer truly loved everything about his life. His success was rooted in his love of his fellow man, and his legacy stands firm in West Michigan.